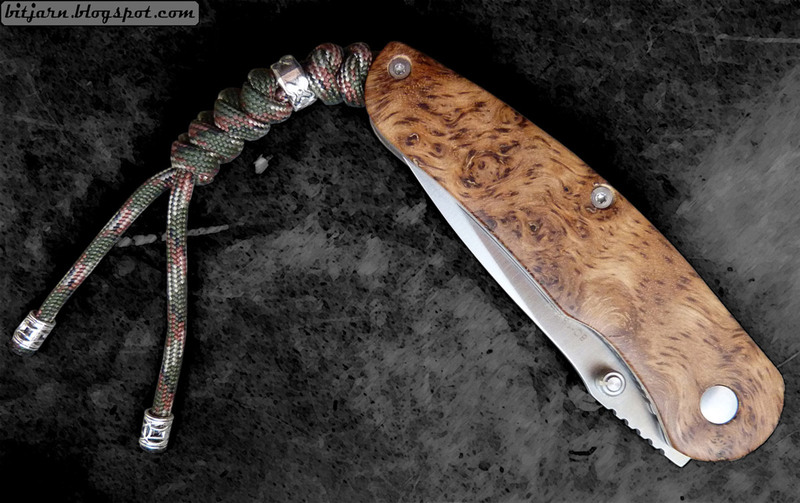 Sold pimped folding knives, some at eBay and Etsy and some through this site. 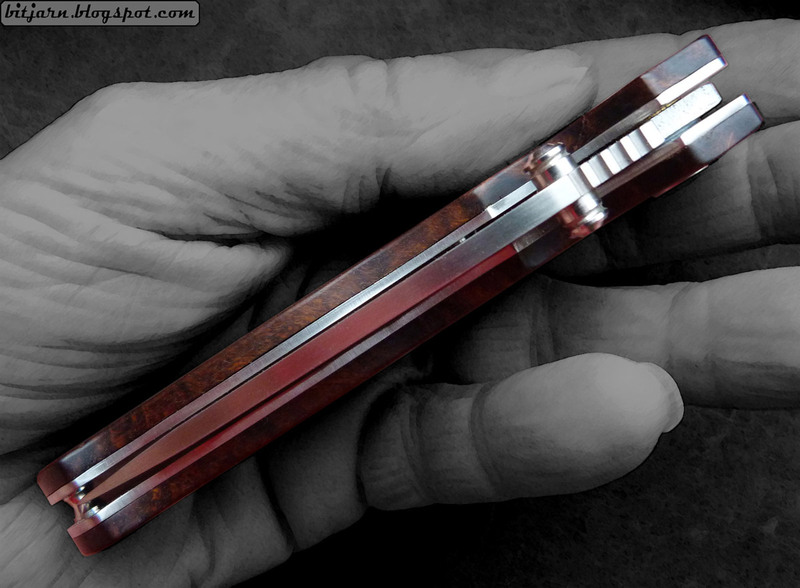 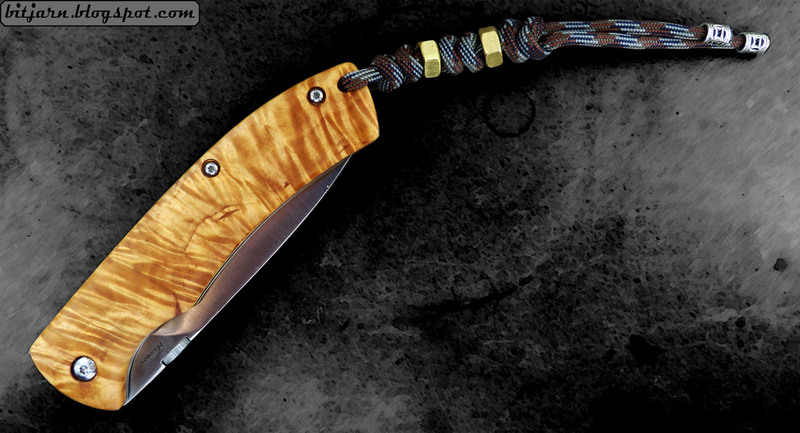 For recent knives in stock, check out the Pimped Folding Knife... page. 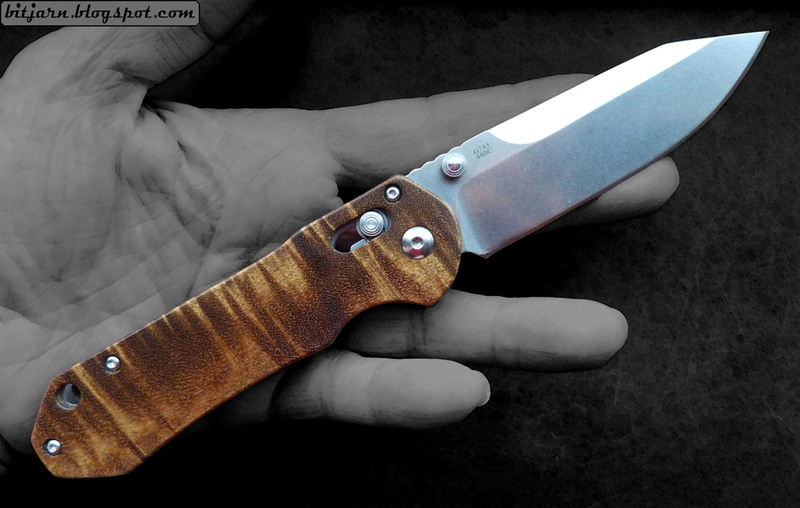 Robust and tough Enlan EL01 folding knife. Handle in curly Birch Burl scales. 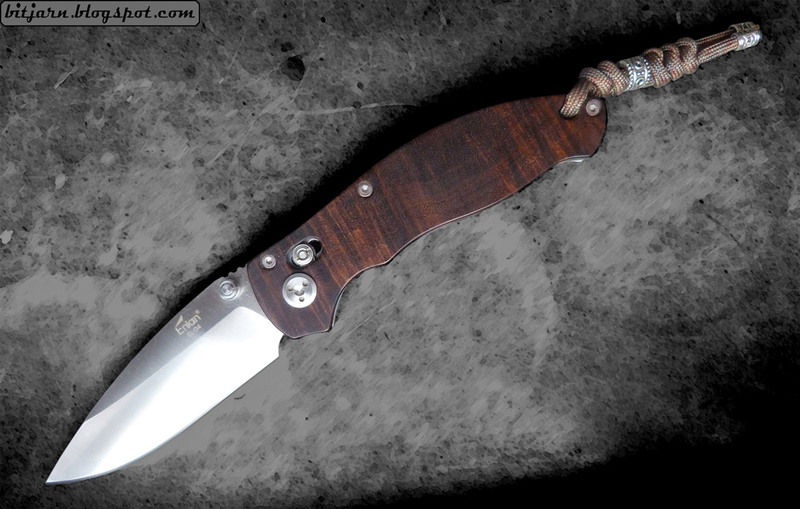 Blade in 8Cr13Mov stainless steel. 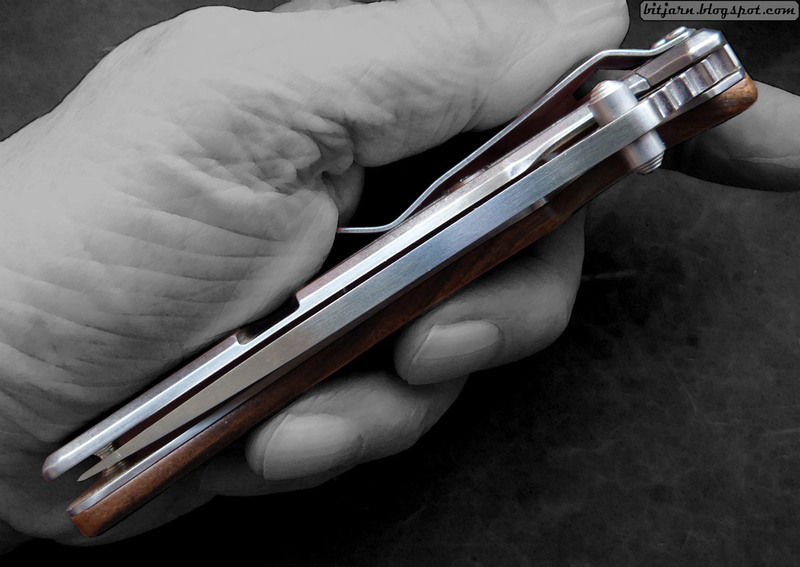 Liner lock construction. 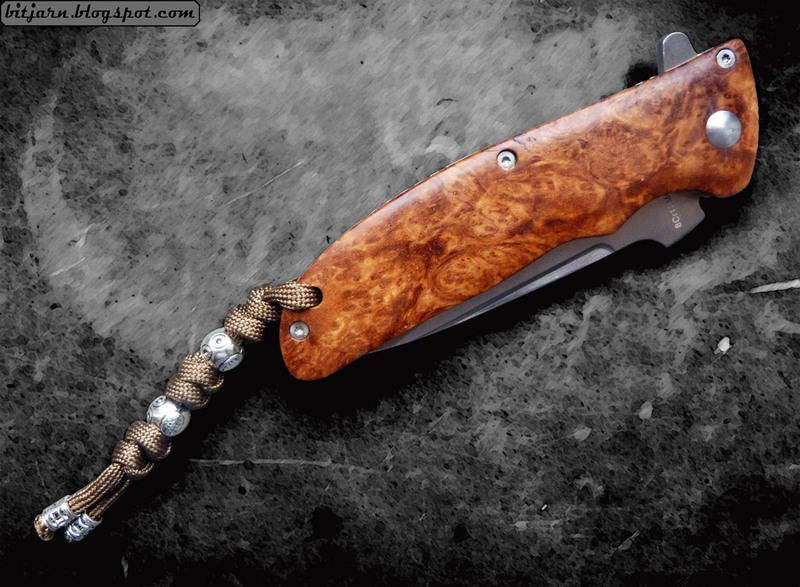 Enlan L02 folding knife with handle in curly Acacia Burl scales and blade in 8Cr13Mov stainless steel. 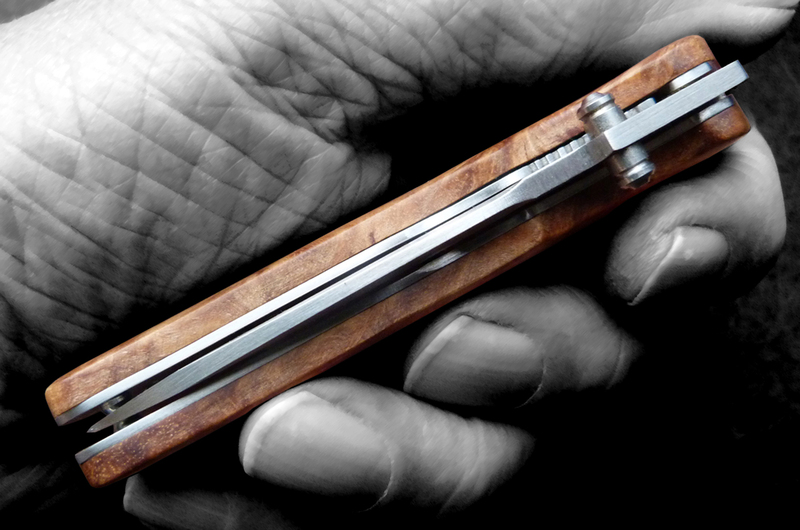 Liner lock construction. 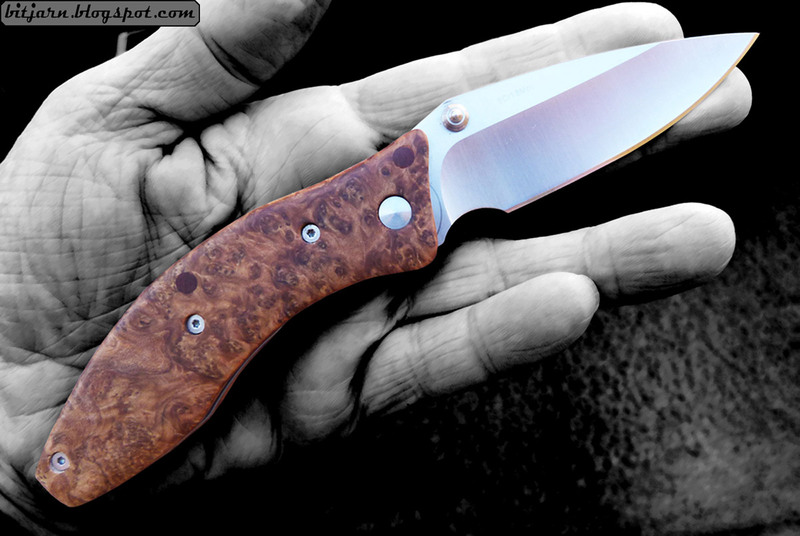 Enlan L04 folding knife with handle in curly Acacia Burl scales and blade in 8Cr13Mov stainless steel. 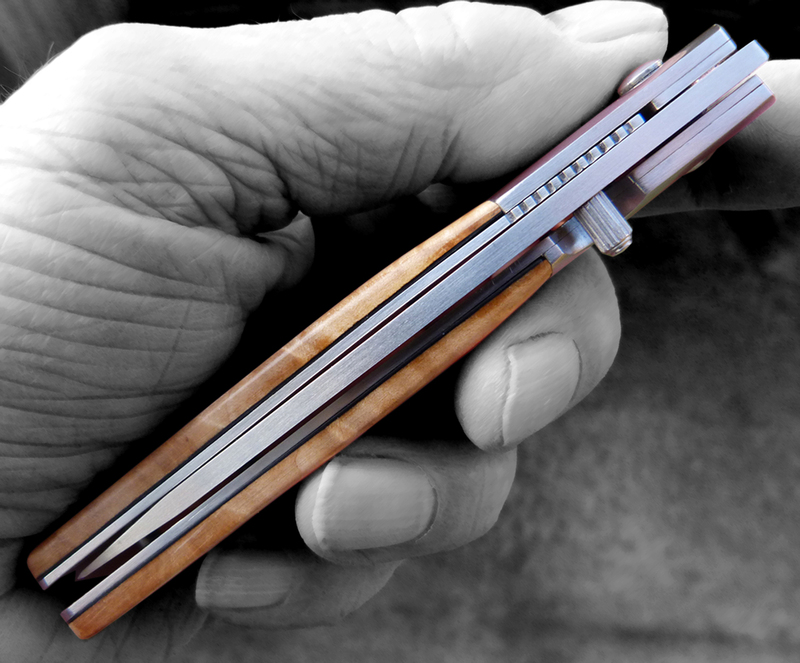 Liner lock construction. 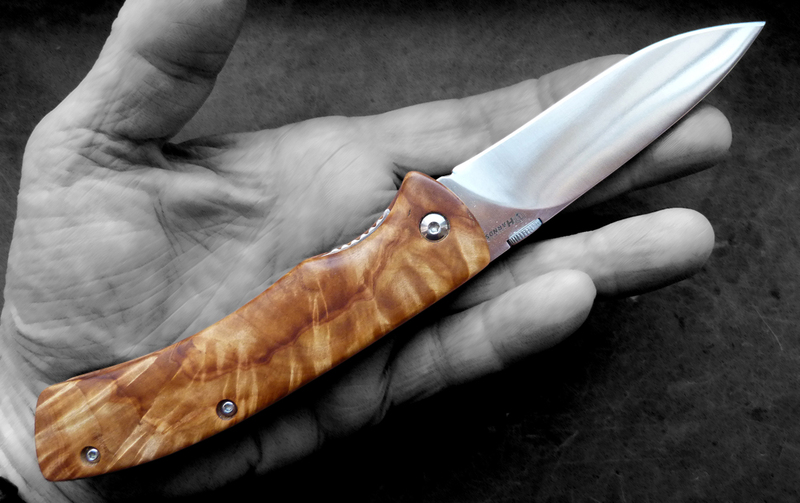 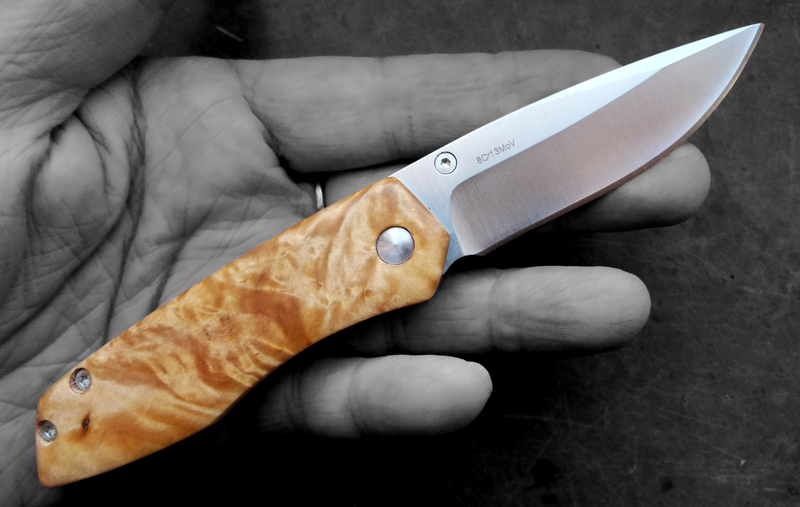 Harnds Viper folding knife with handle in curly Birch Burl scales and blade in 9Cr18Mov stainless steel. 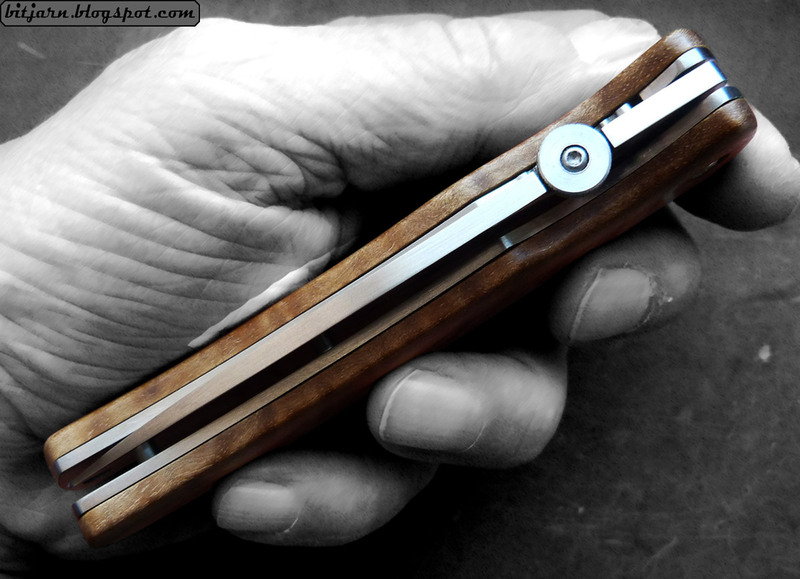 Liner lock construction. 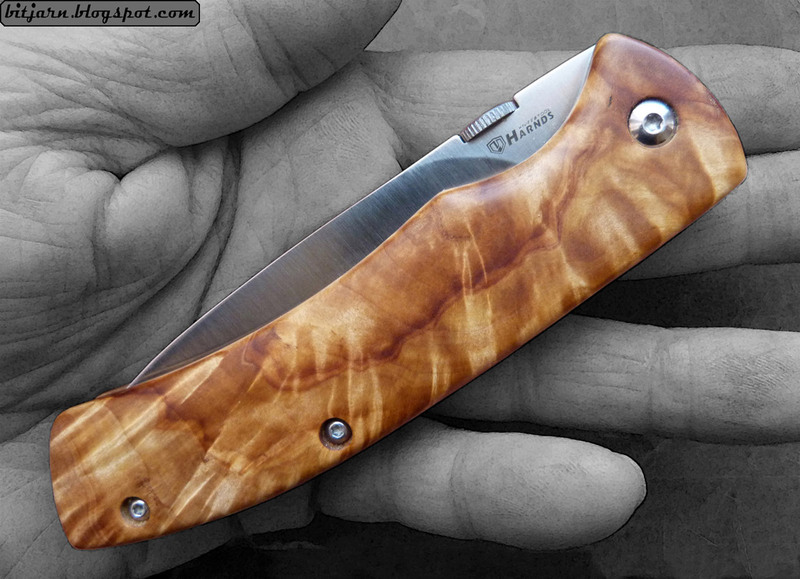 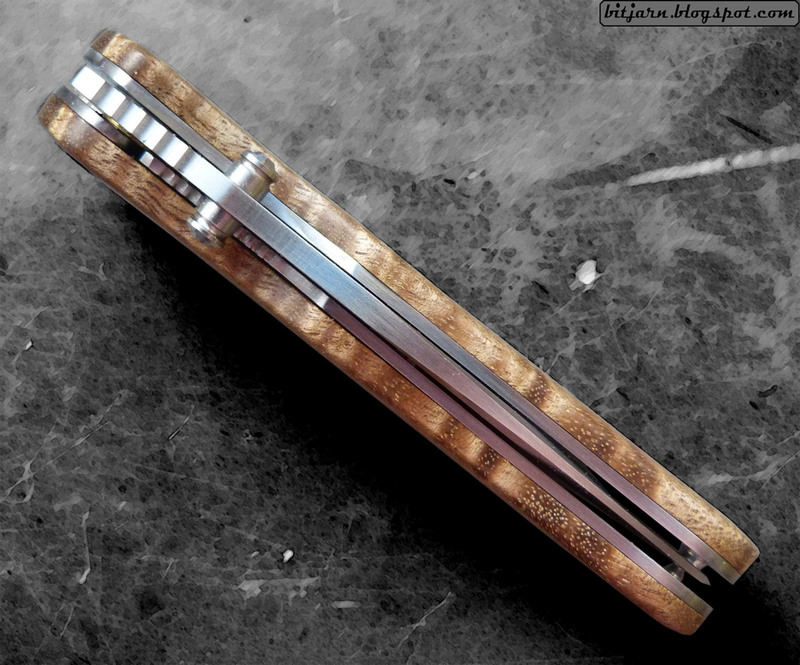 Magnum folding knife with new curly Acacia Burl scales, blade in 440C stainless steel. 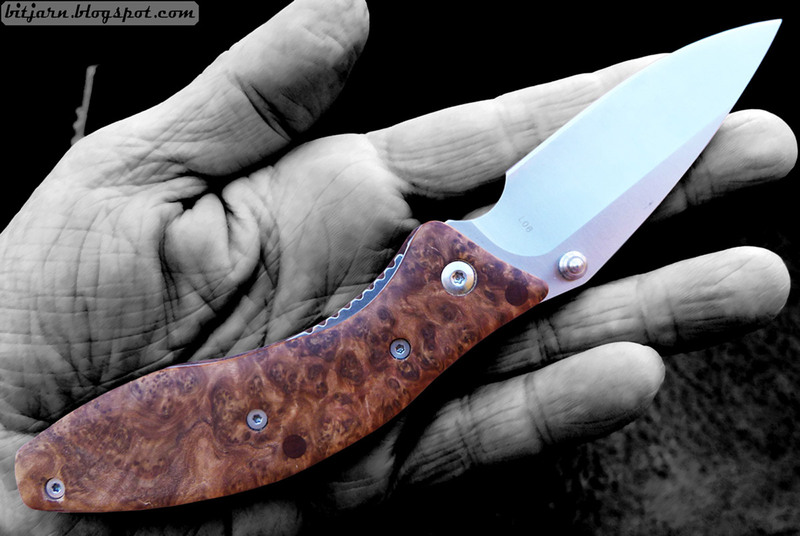 Enlan MO11 folding knife with handle in curly Birch Burl scales and blade in 8Cr13Mov stainless steel. 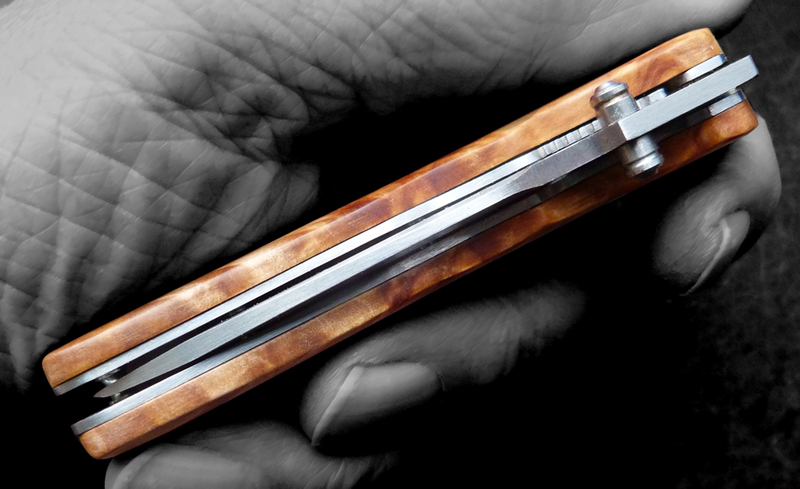 Liner lock construction. 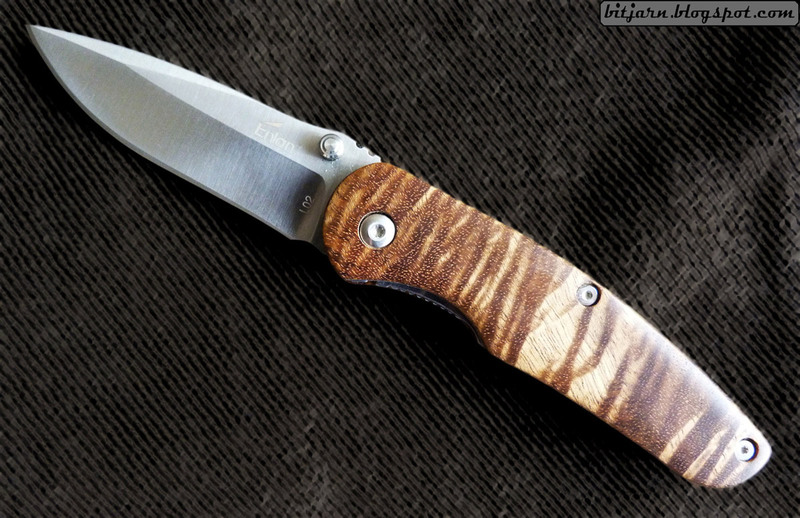 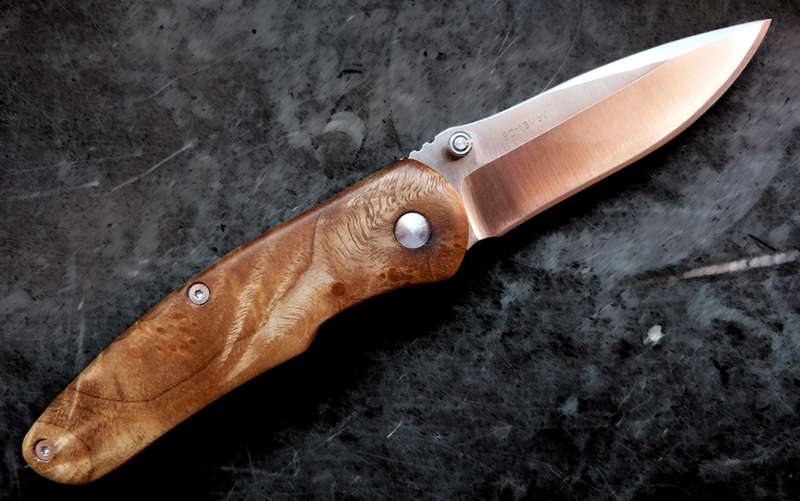 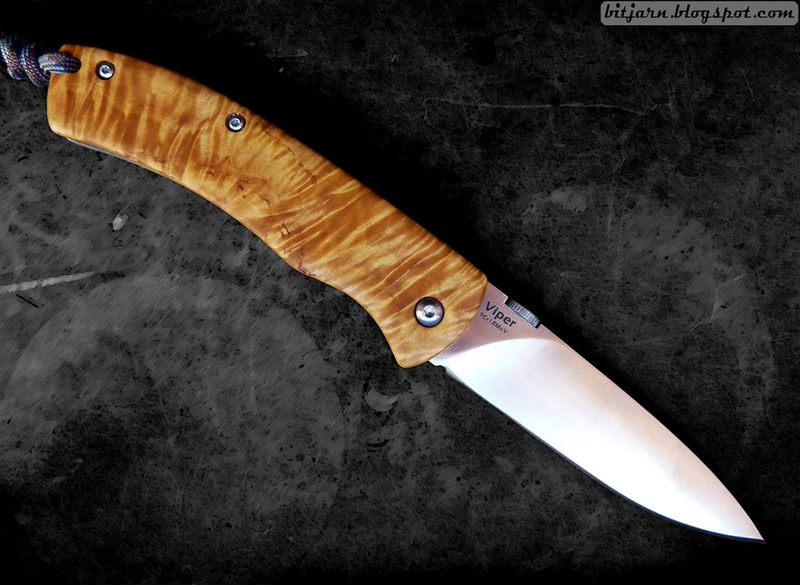 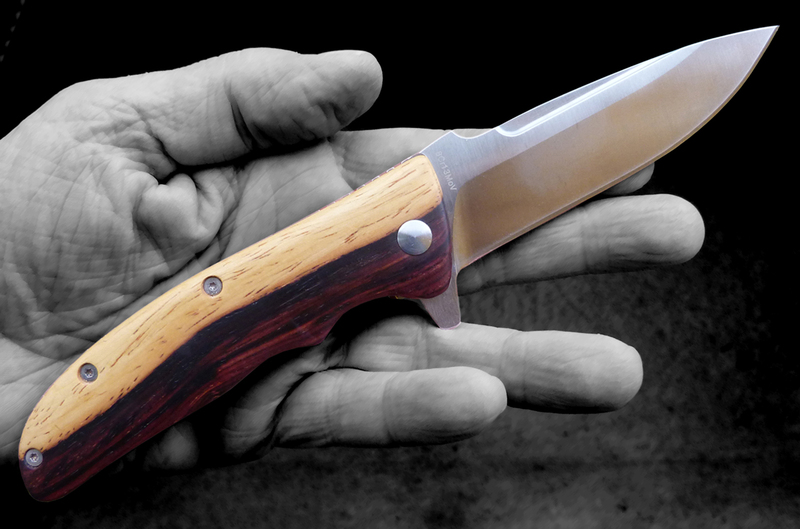 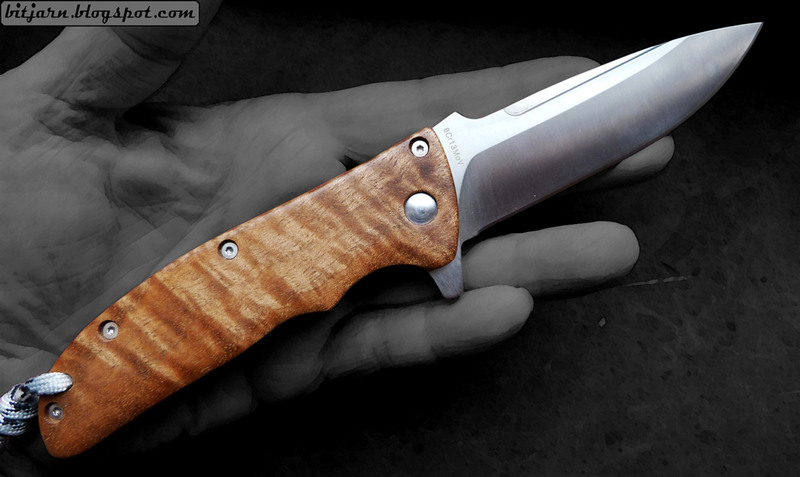 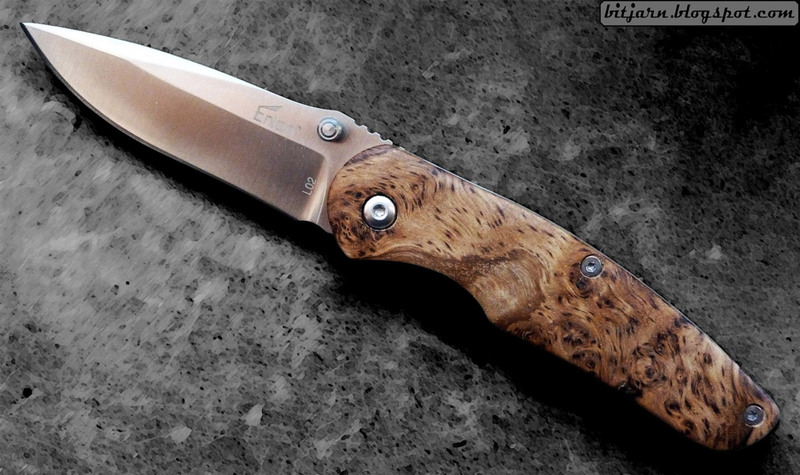 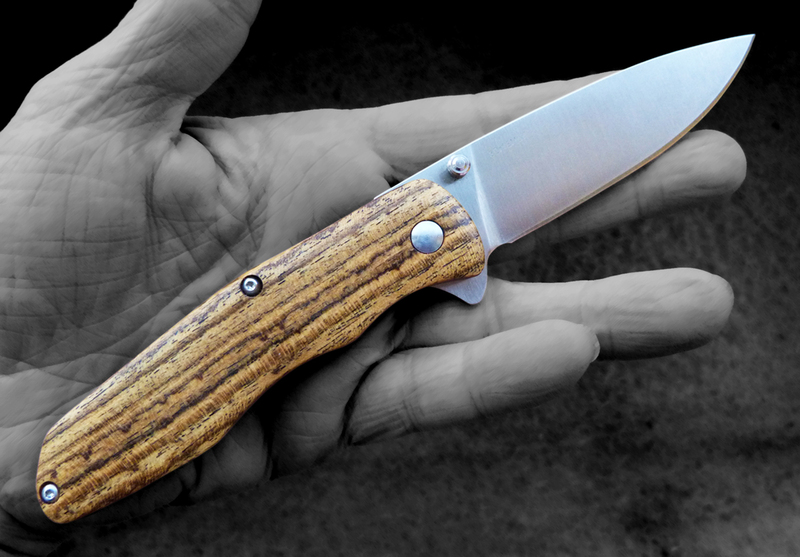 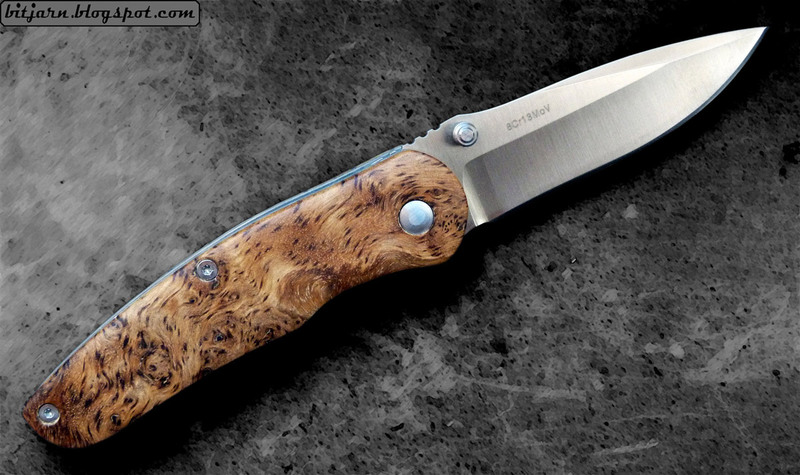 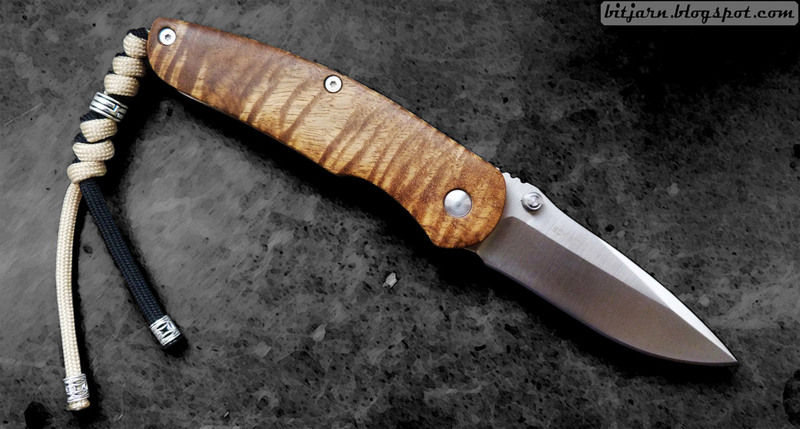 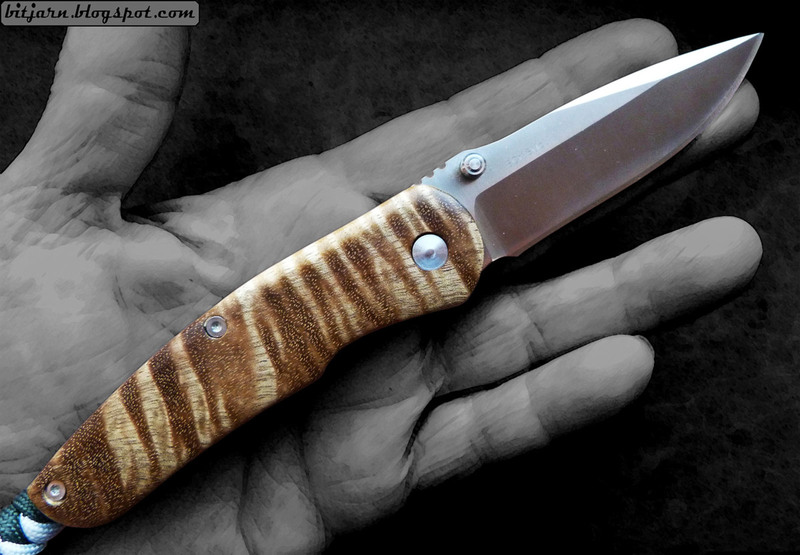 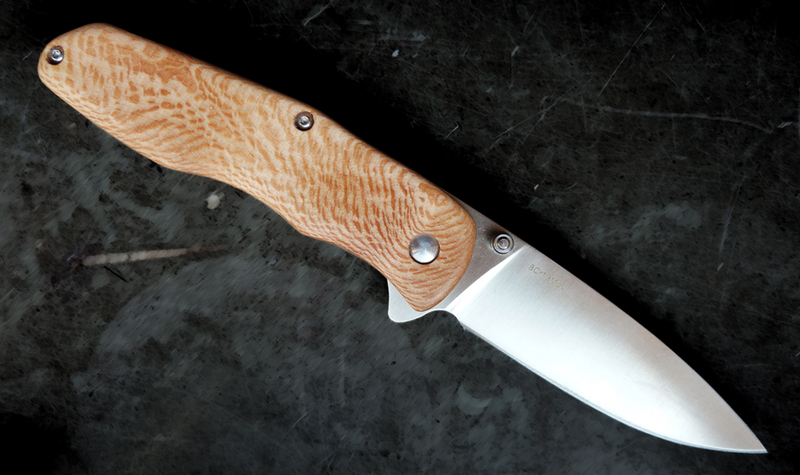 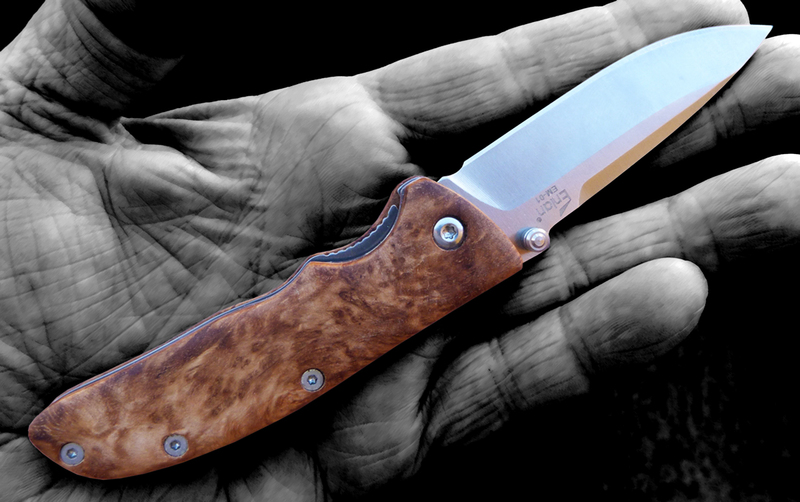 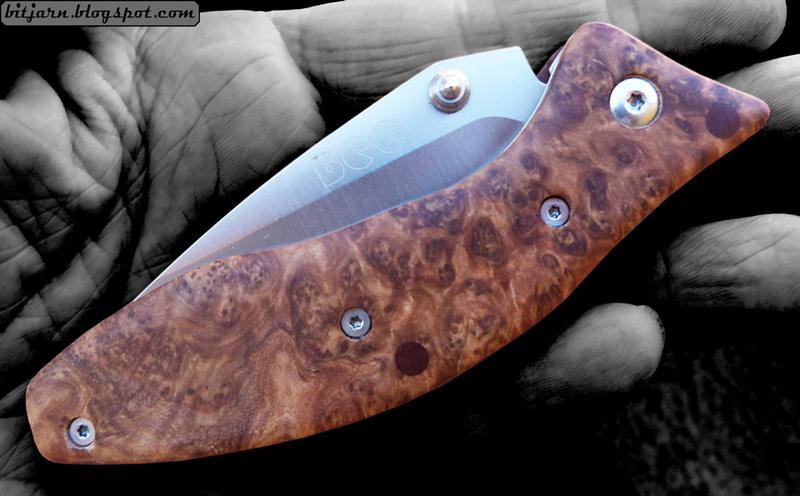 Enlan EL-04 folding knife with curly Birch Burl scales, blade in 8Cr13Mov stainless steel. 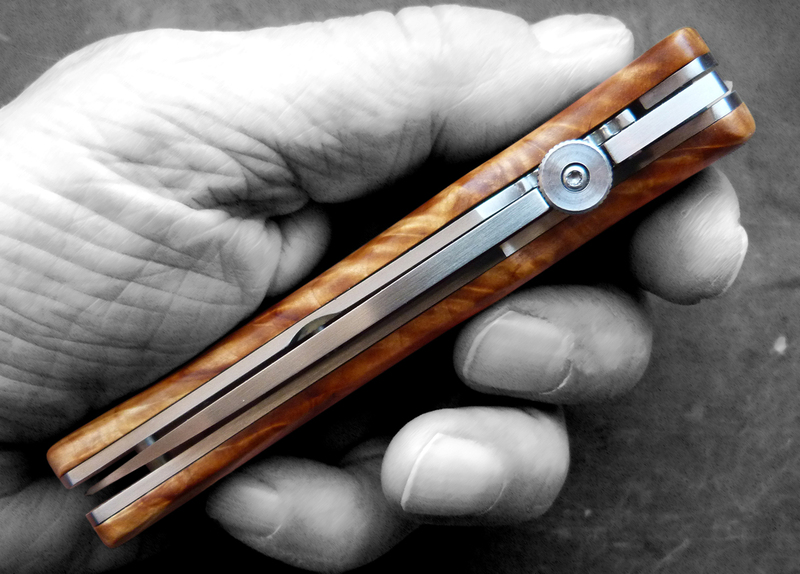 Axis lock function. 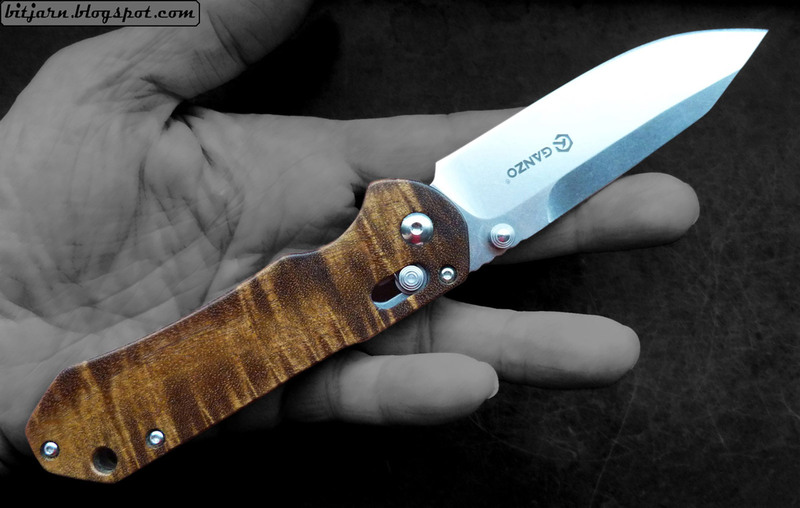 Ganzo folding knife with scale in very nice colored Walnut and blade in 440C stainless steel. 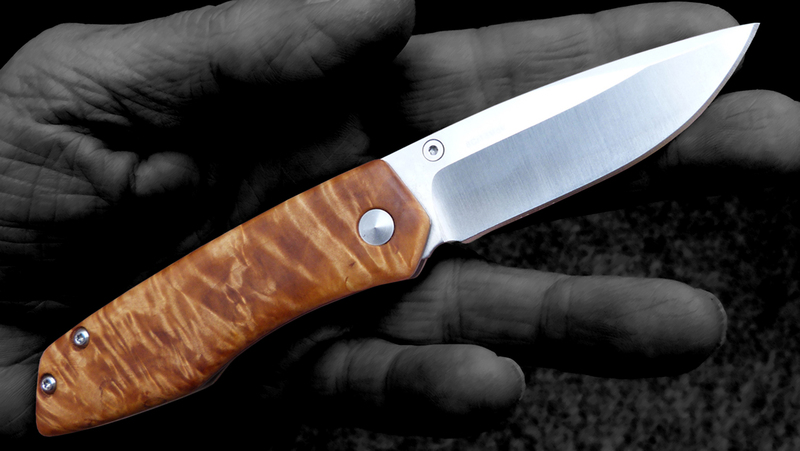 Ganzo folding knife with scales in curly Acacia Burl scales. 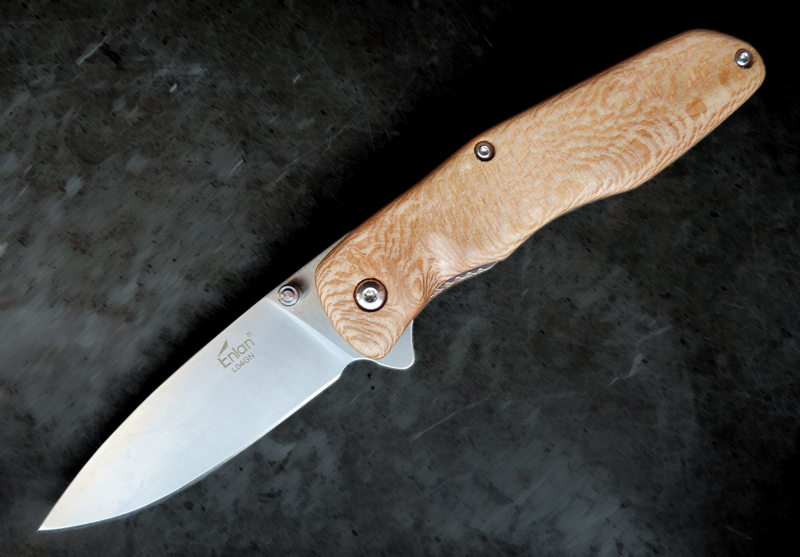 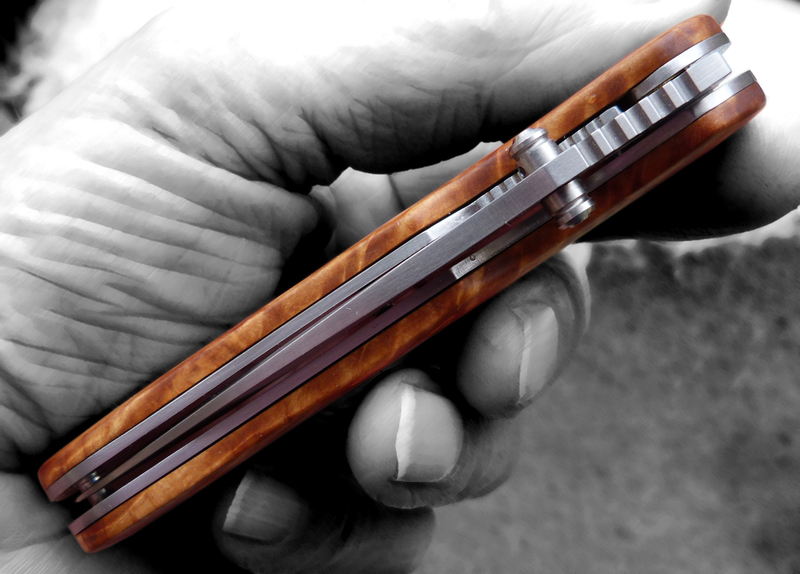 The blade is made in classic 44C steel. 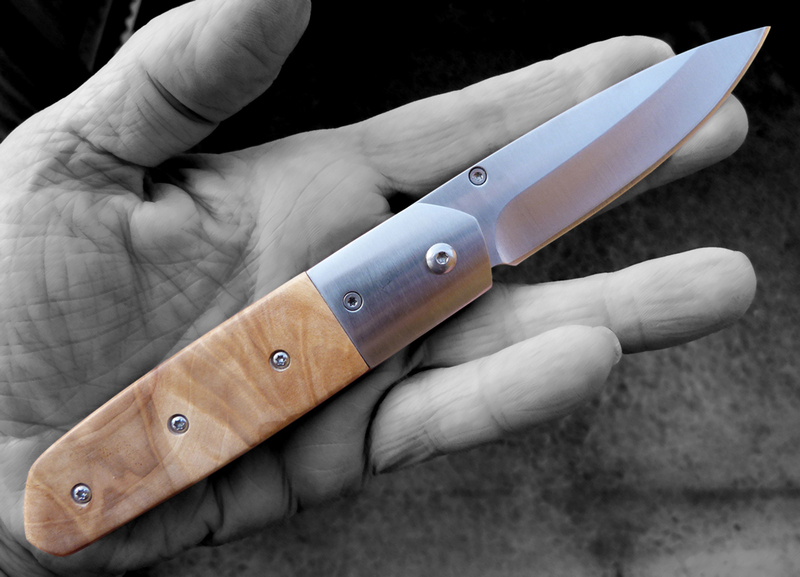 A very nice and well designed and balanced knife that's also very sturdy. 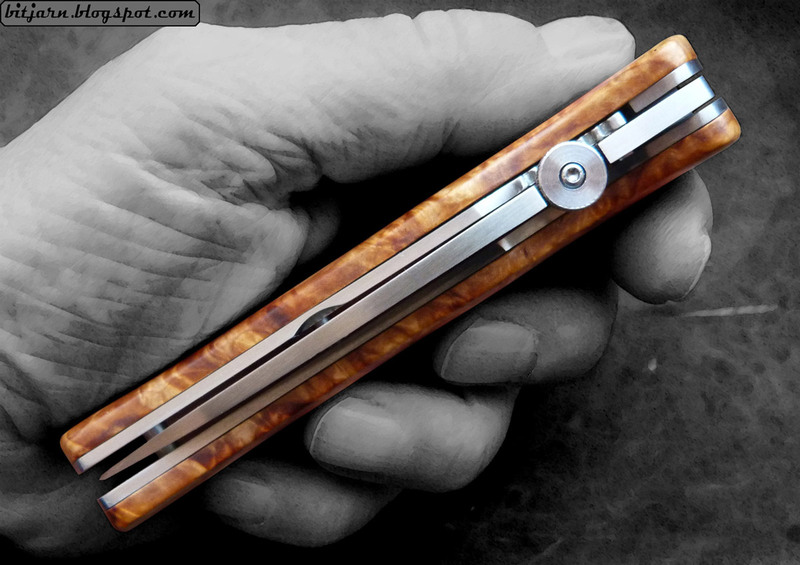 Axis lock function. 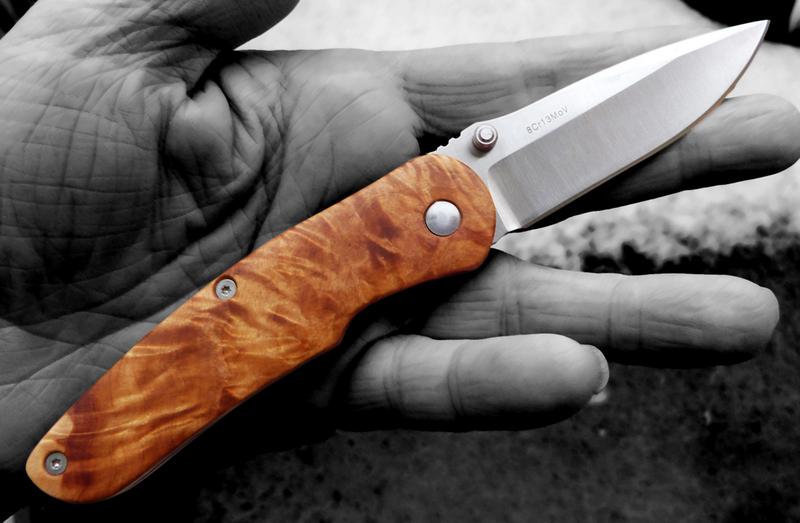 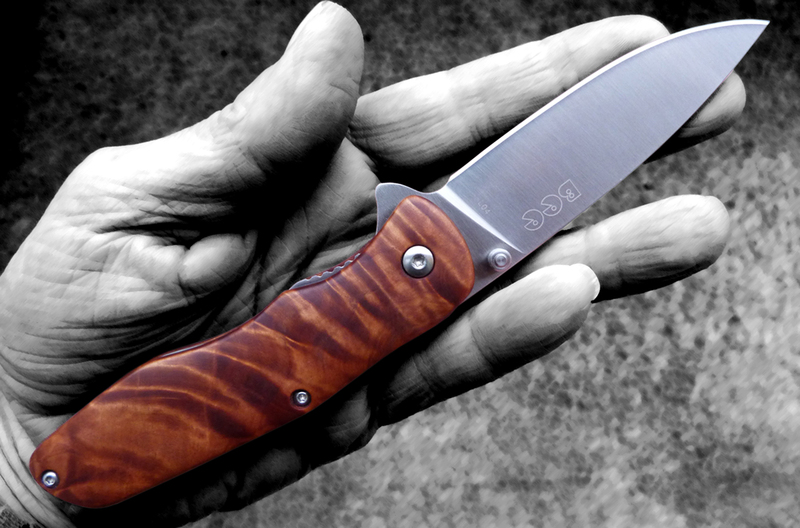 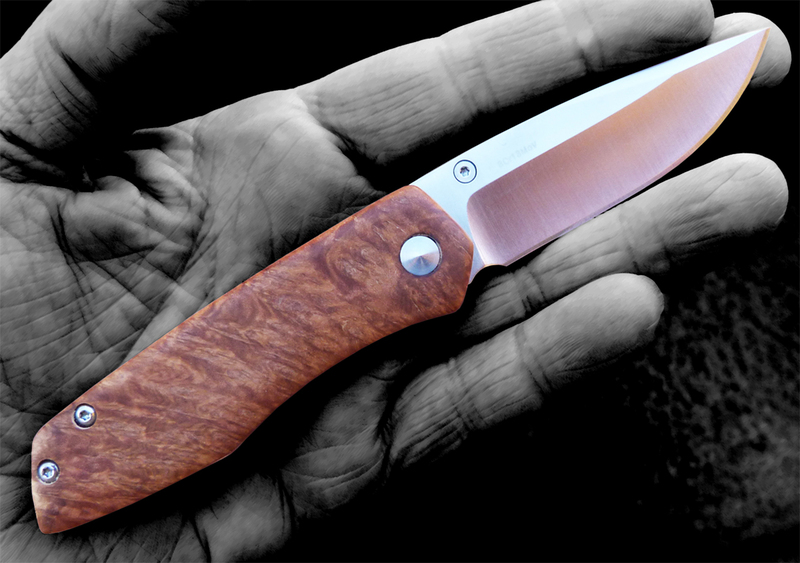 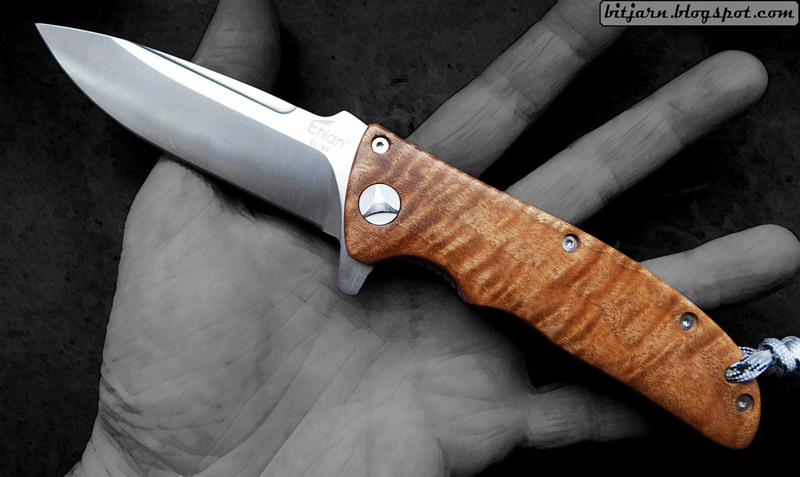 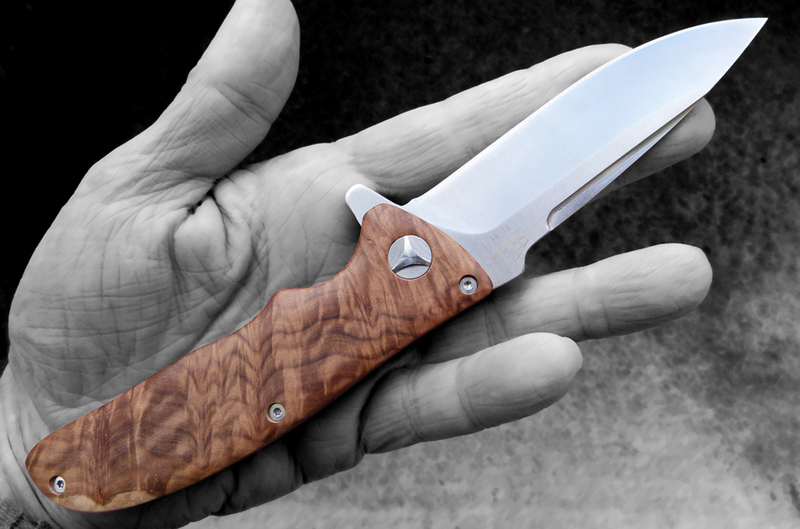 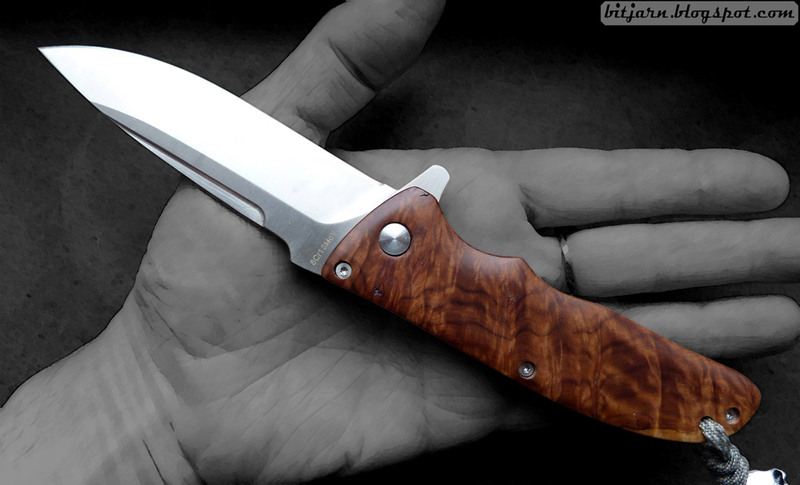 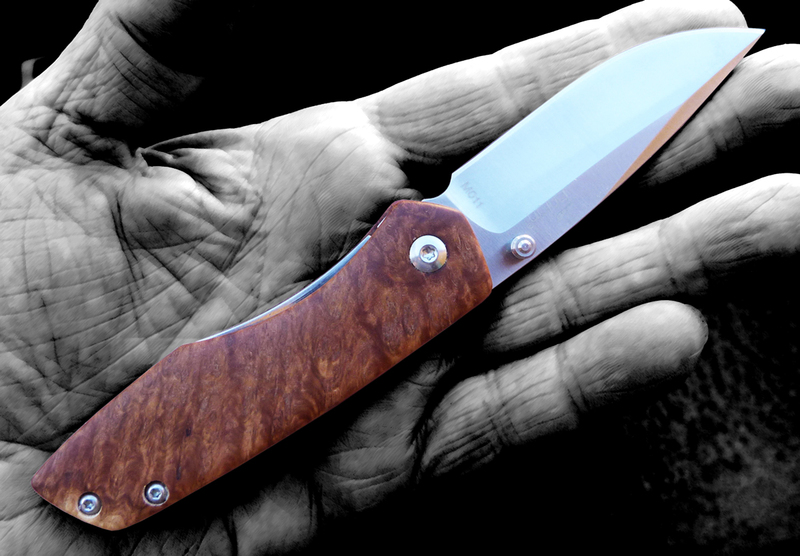 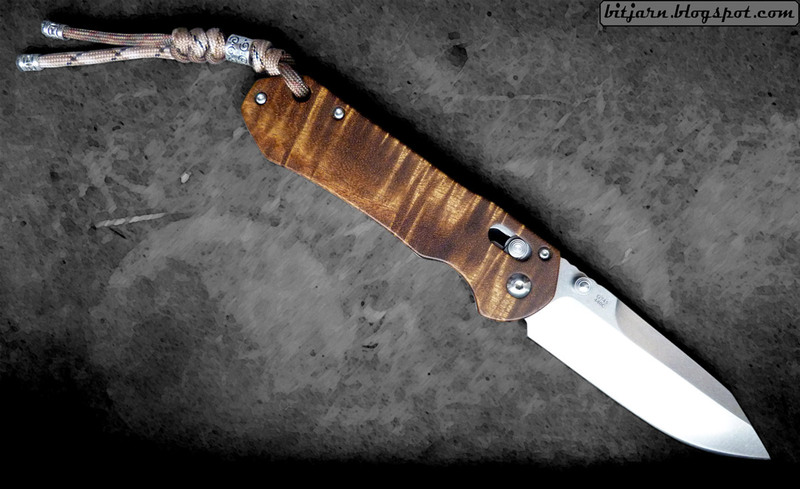 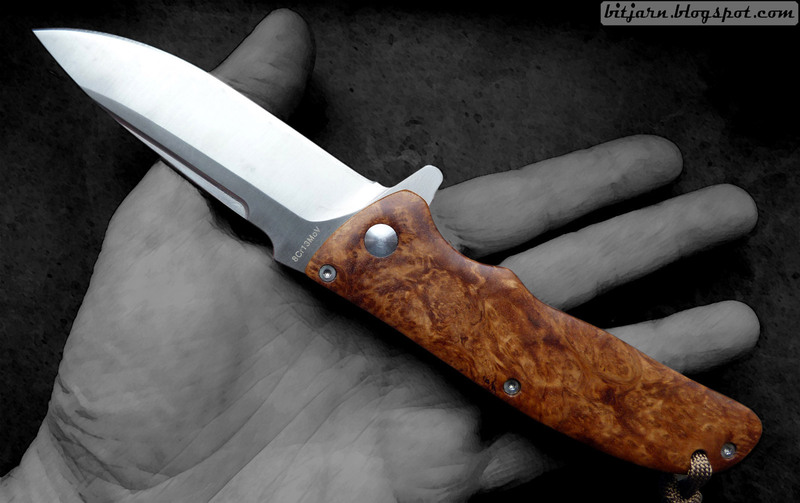 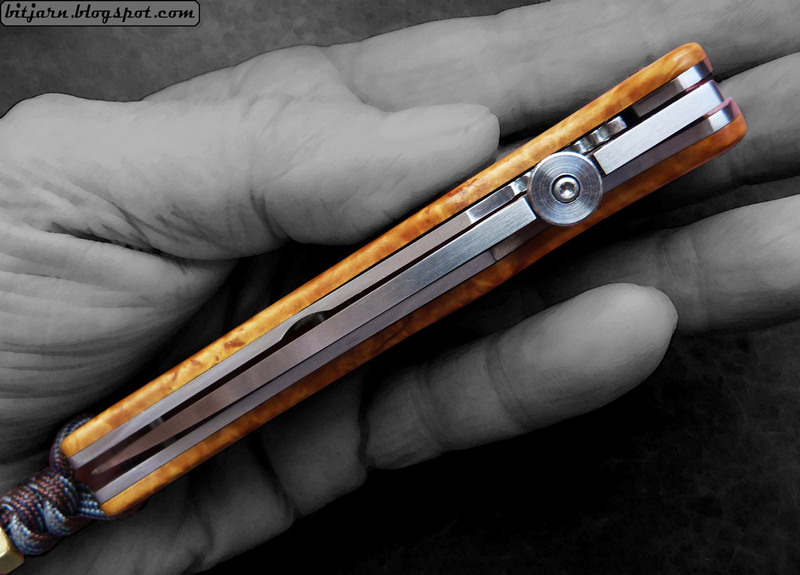 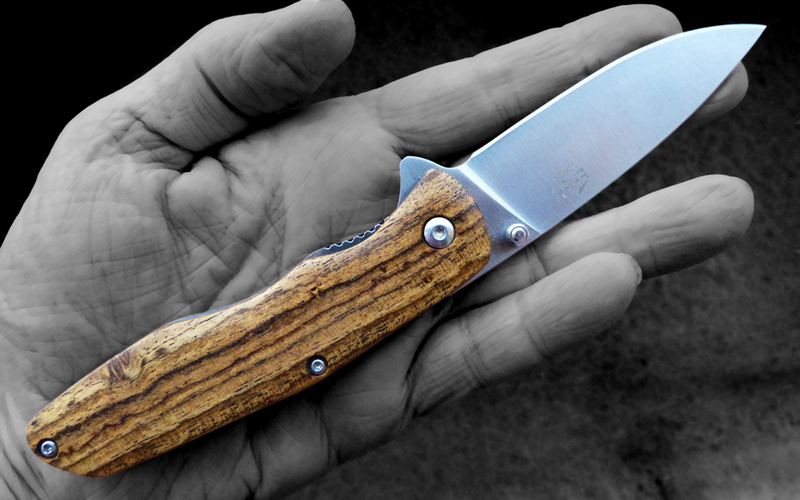 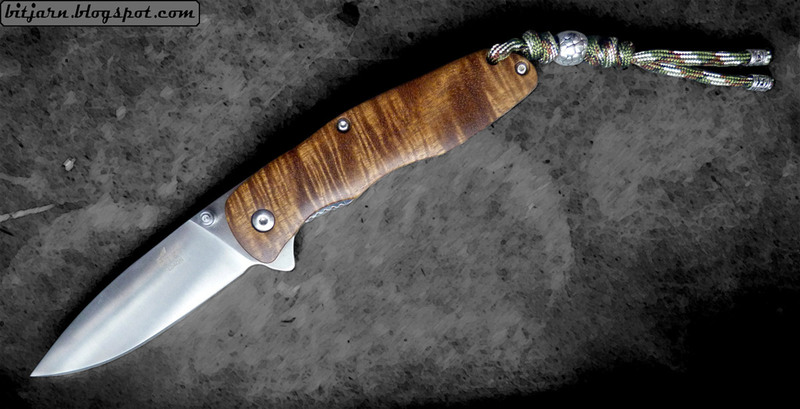 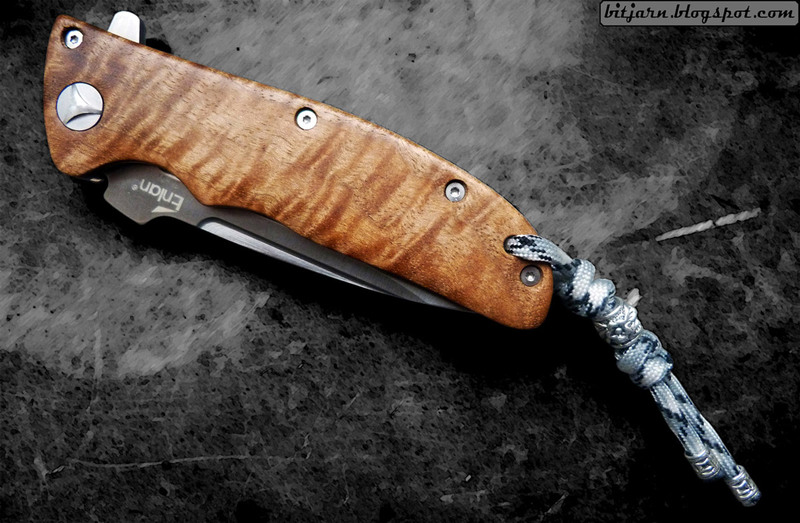 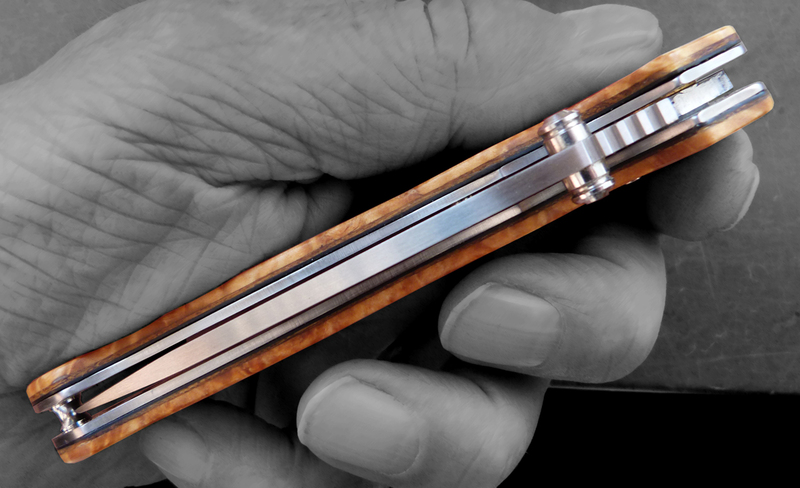 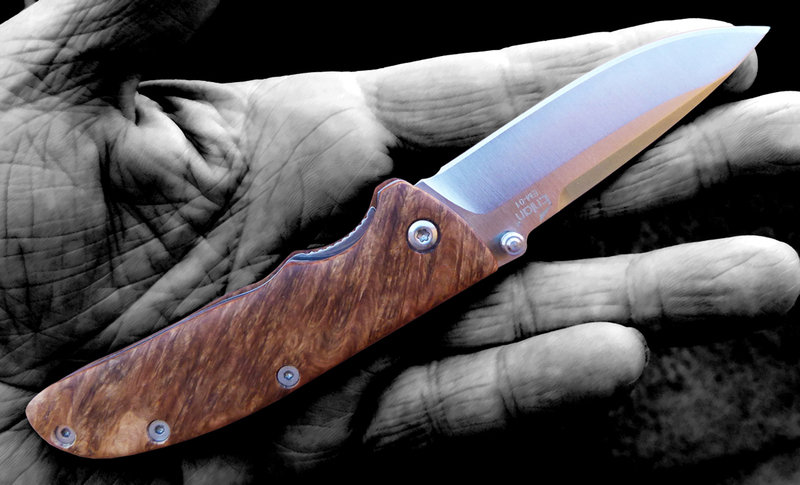 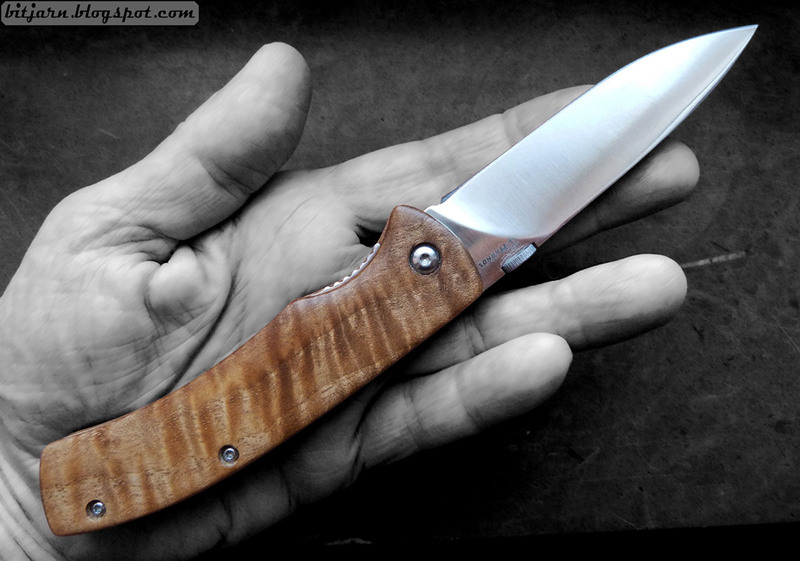 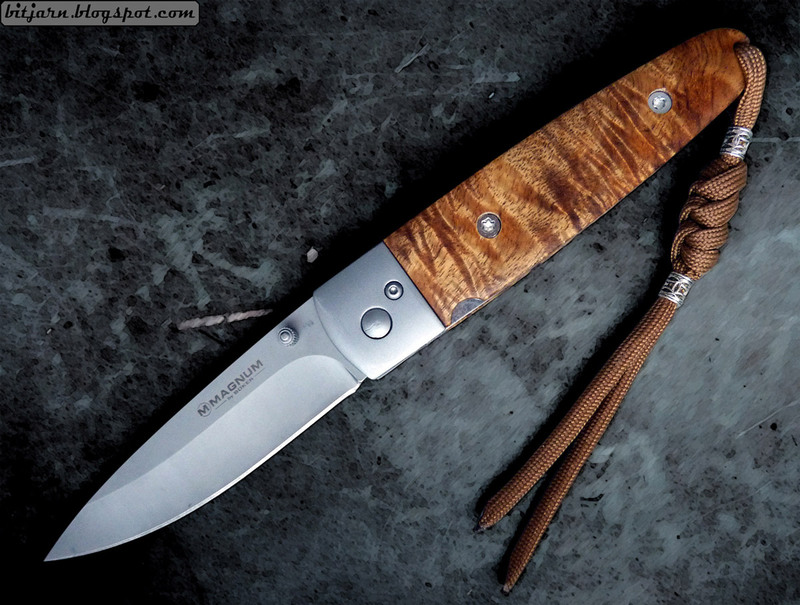 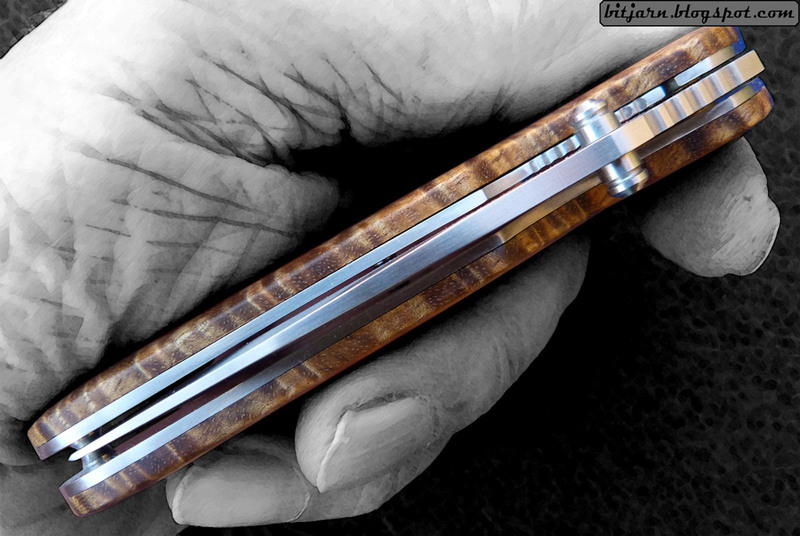 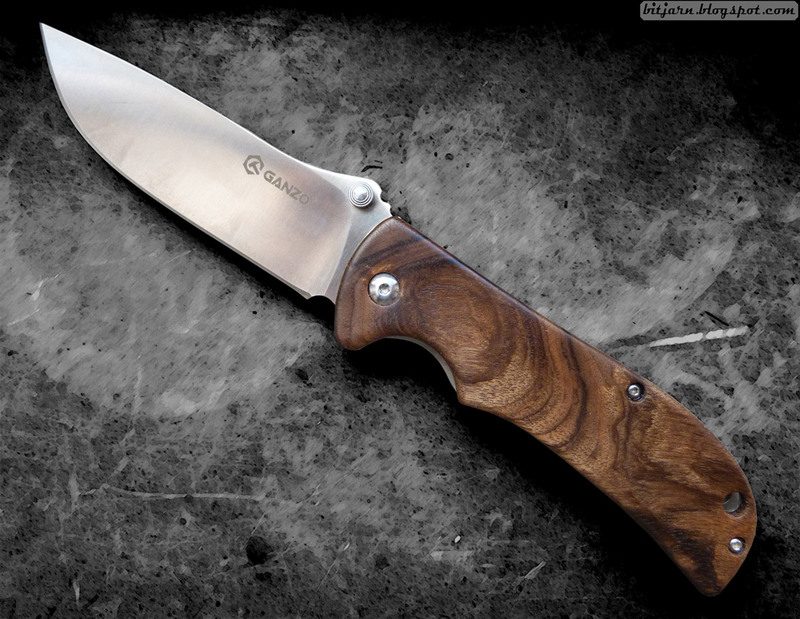 Enlan L02 folding knife with handle in Teak Burl and blade in 8Cr13Mov stainless steel. 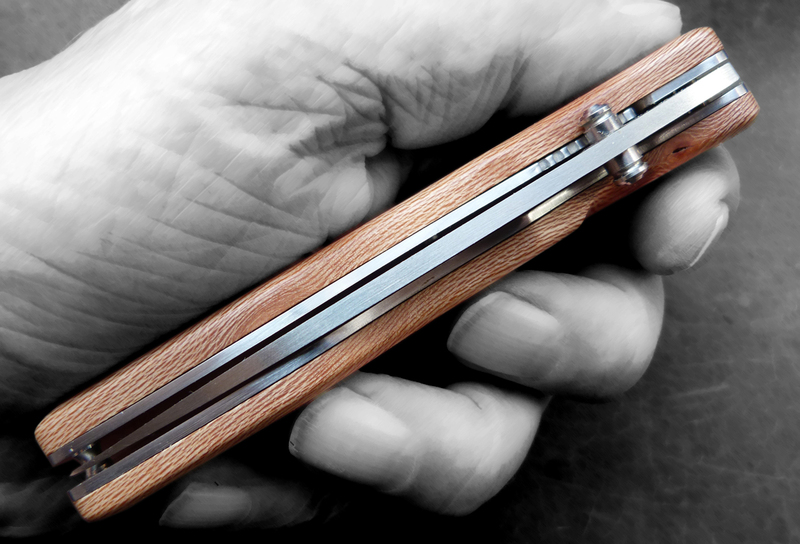 Liner lock construction. 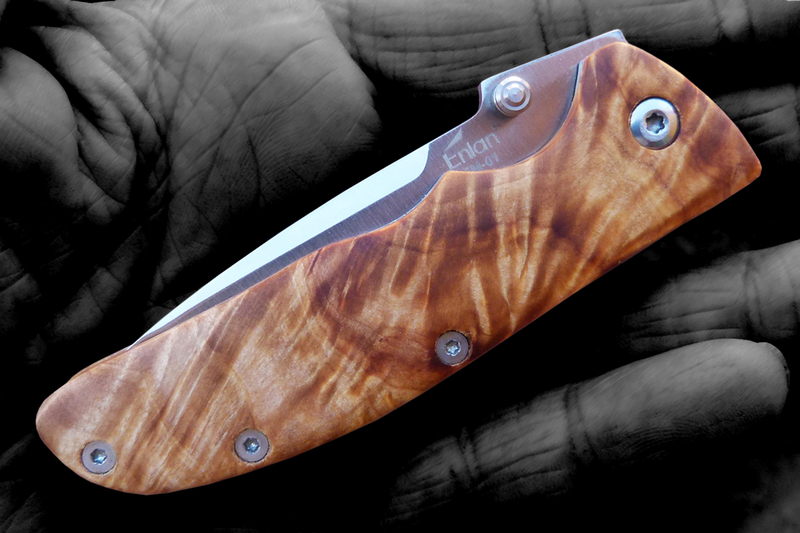 Enlan EL-04 folding knife with Ringed Gidgee burl scales and blade in 8Cr13Mov stainless steel. 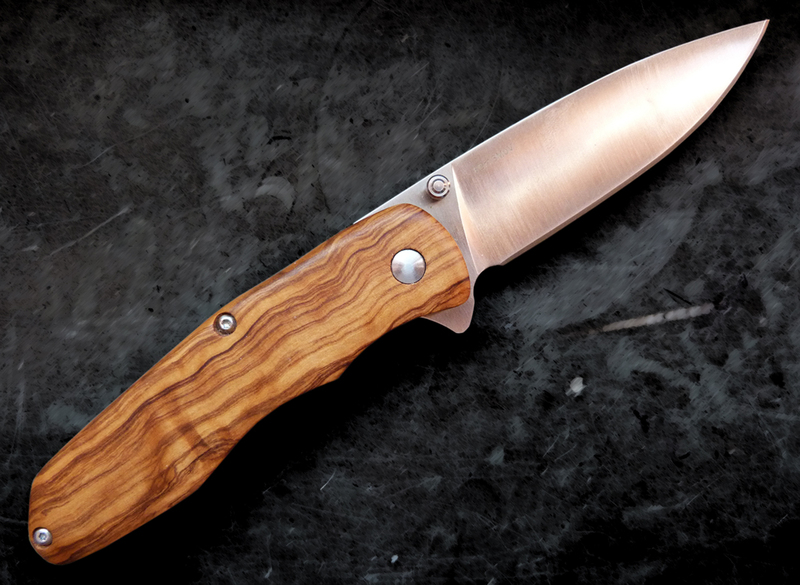 Ringed Gidgee is one of the top five hardest, most dense and stable woods in existence. 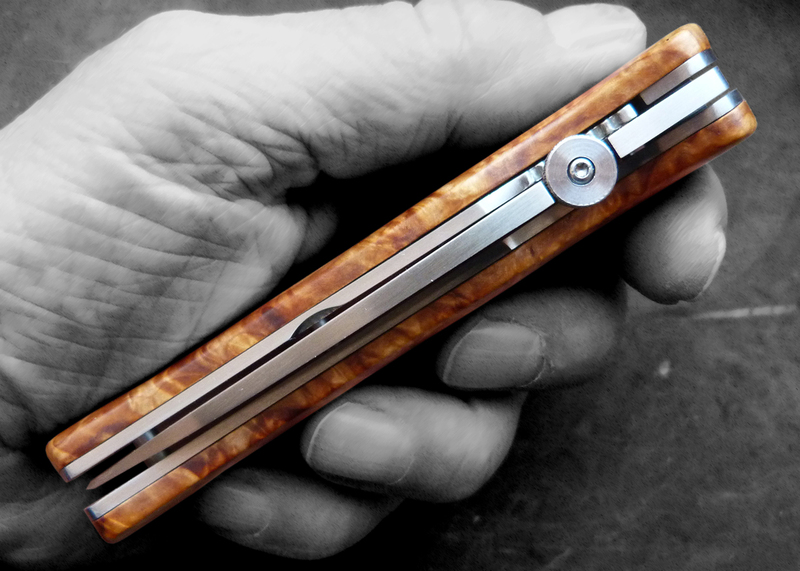 Axis lock function. 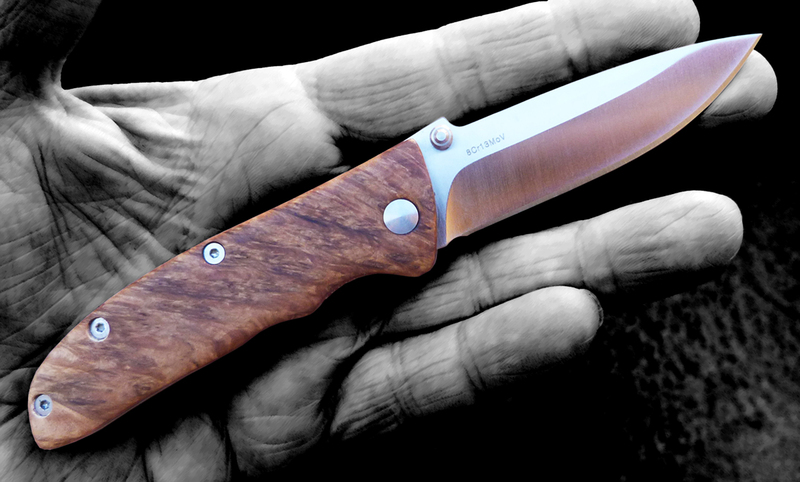 Robust and tough Enlan EL01 folding knife. 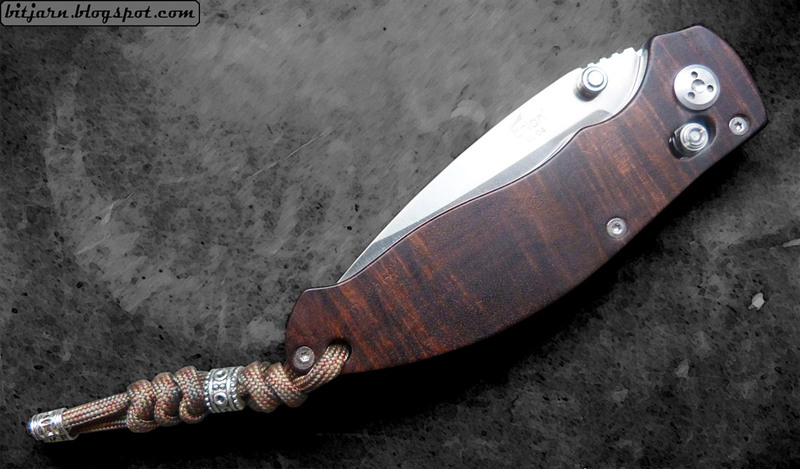 Handle in Aust. 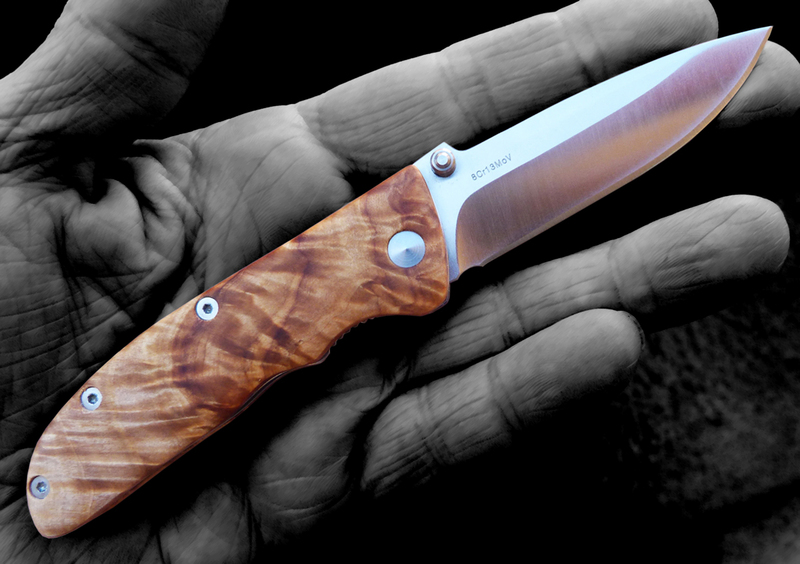 Gum Burl. 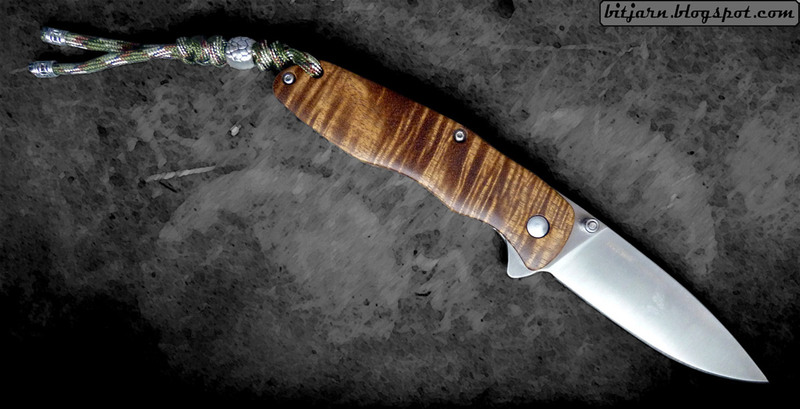 Blade in 8Cr13Mov stainless steel. 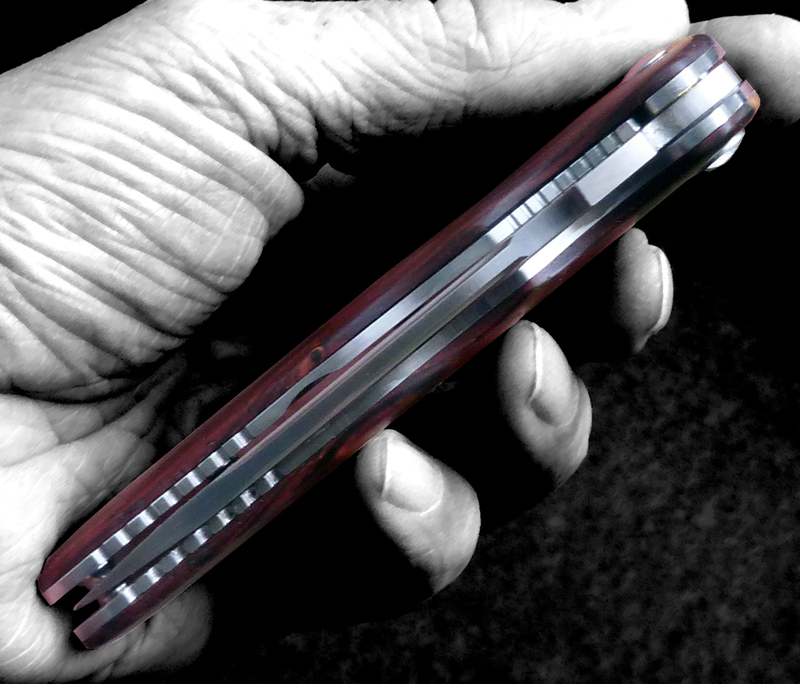 Liner lock construction. 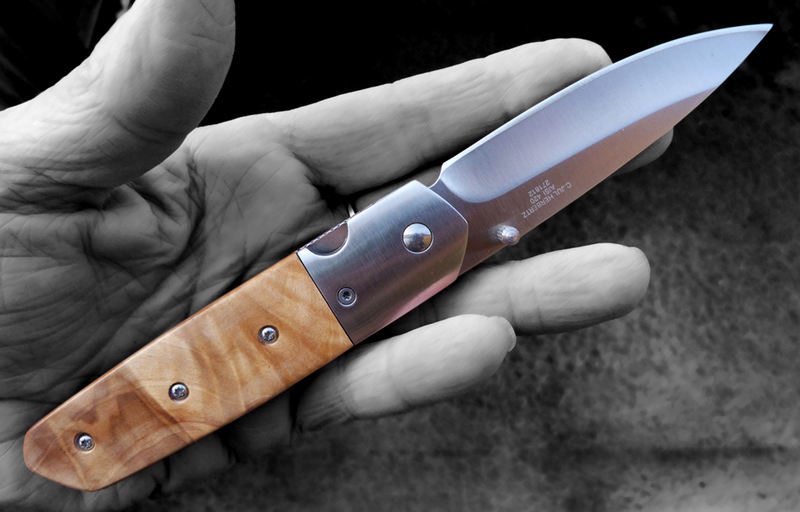 Robust and tough Enlan EL01 folding knife. 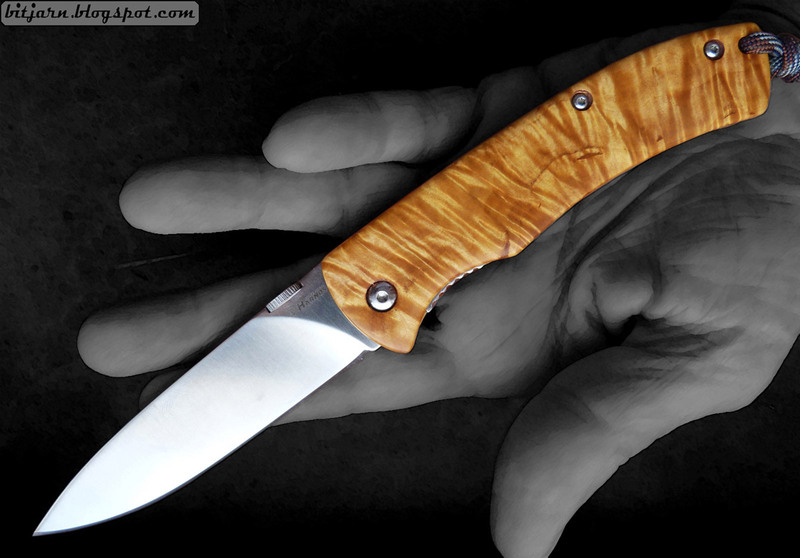 Handle in Curly Maple. 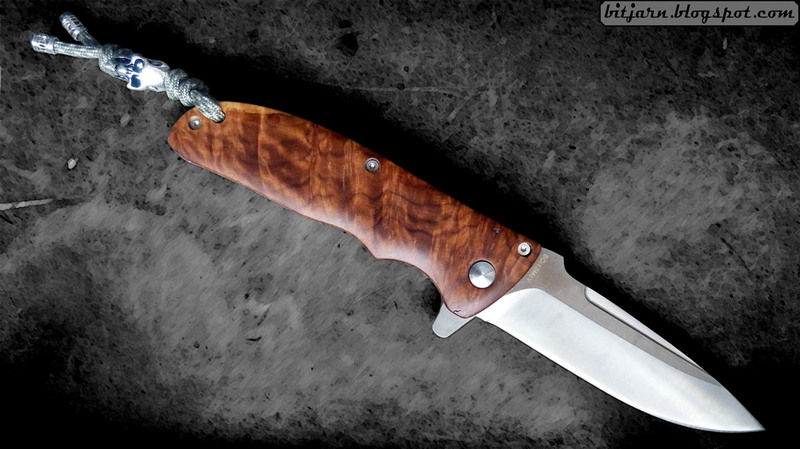 Blade in 8Cr13Mov stainless steel. 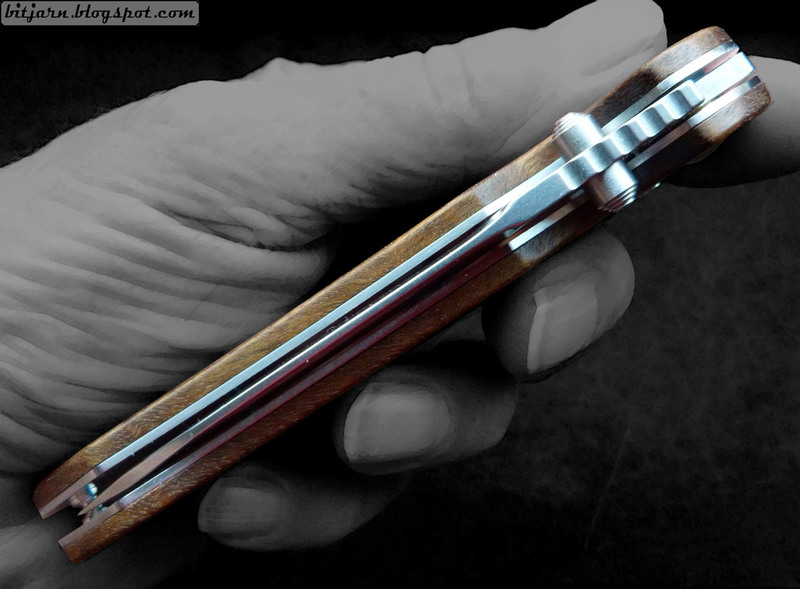 Liner lock construction. 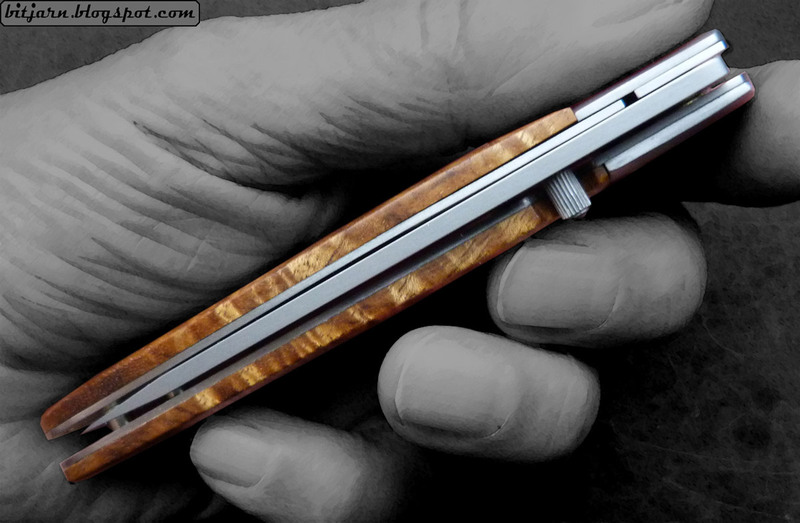 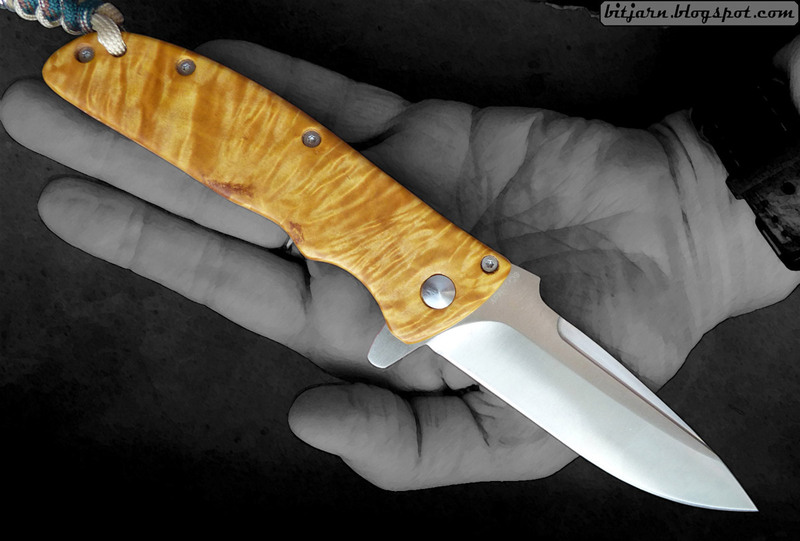 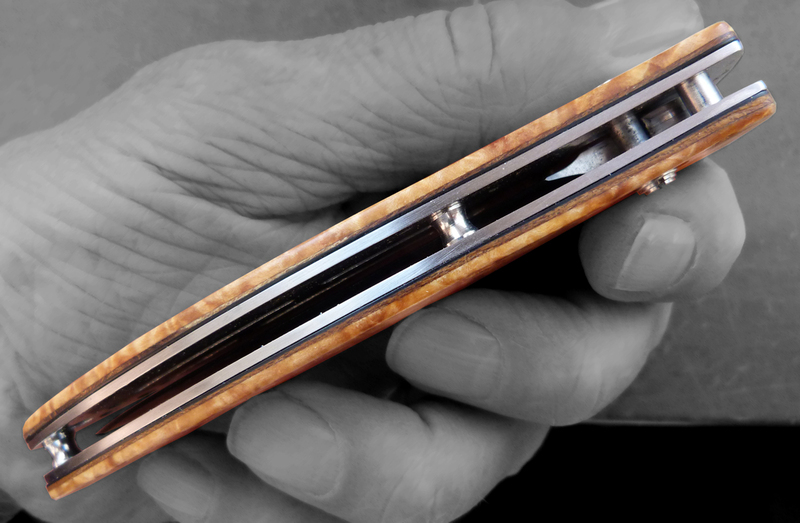 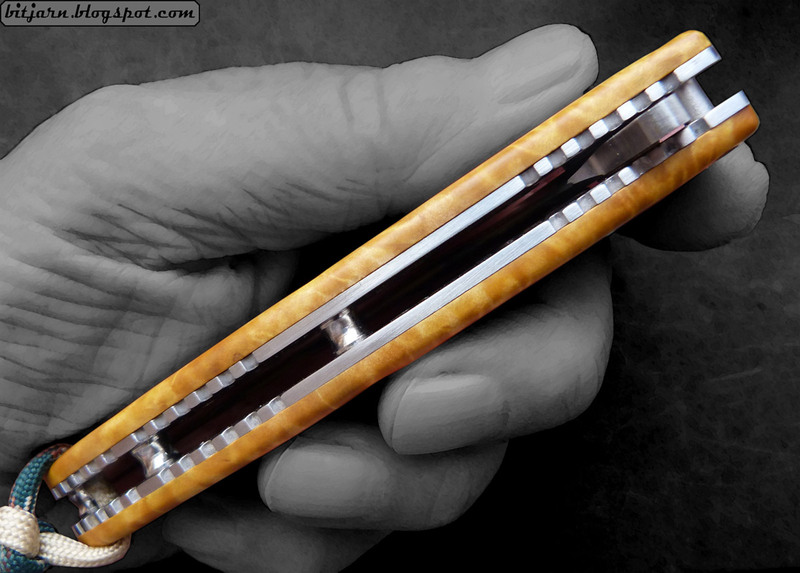 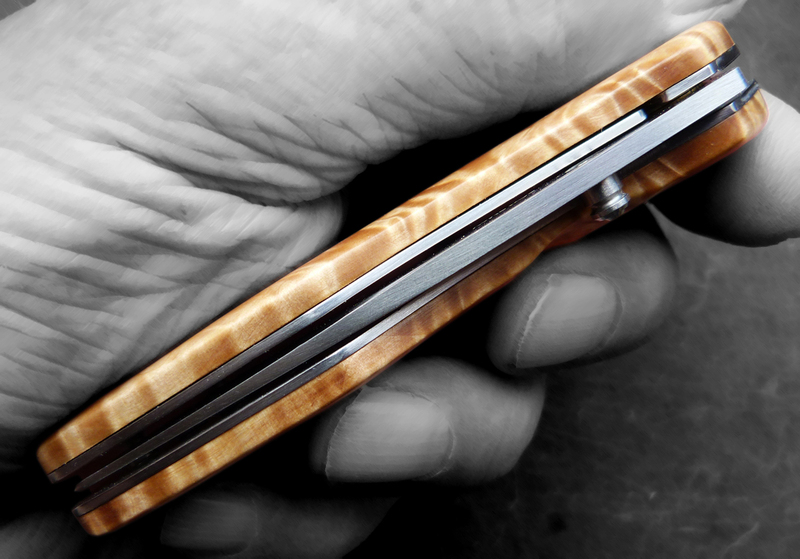 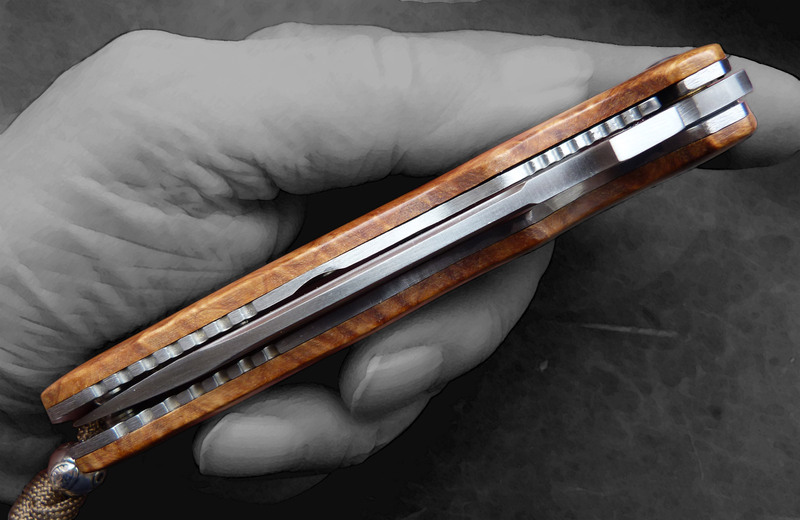 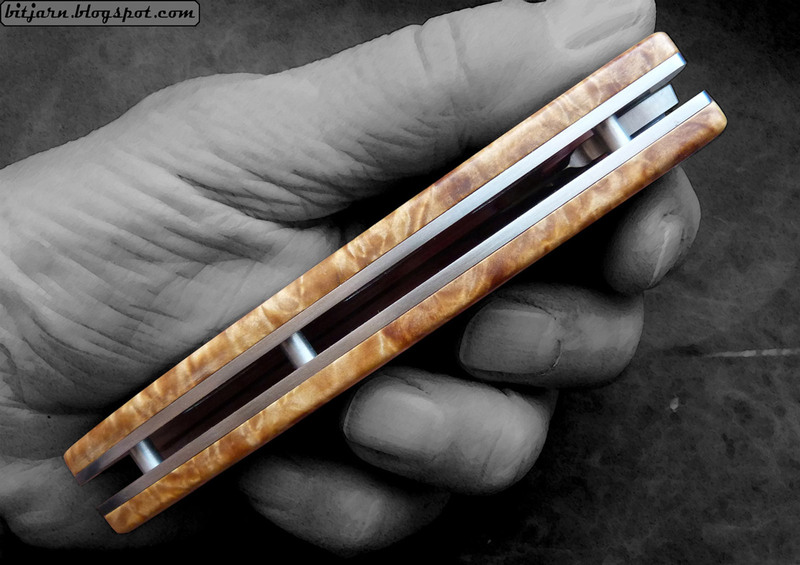 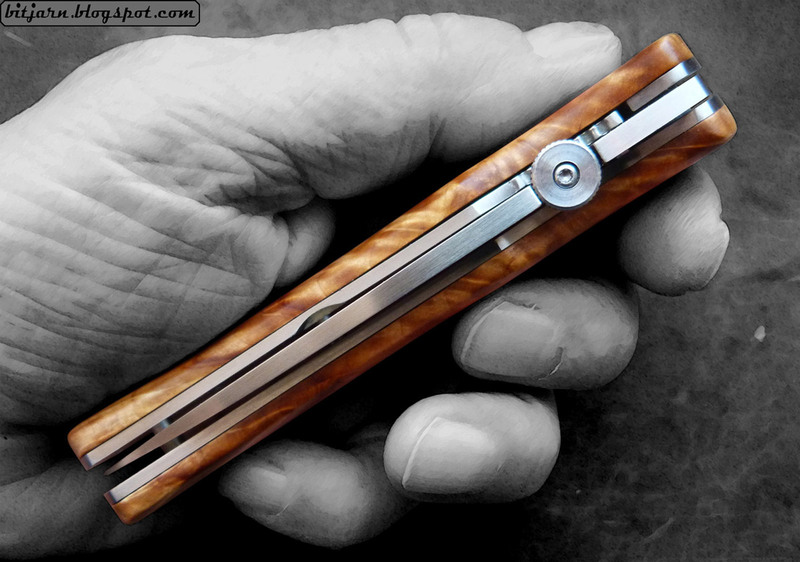 Harnds Viper folding knife with handle in curly maple and blade in 9Cr18Mov stainless steel. 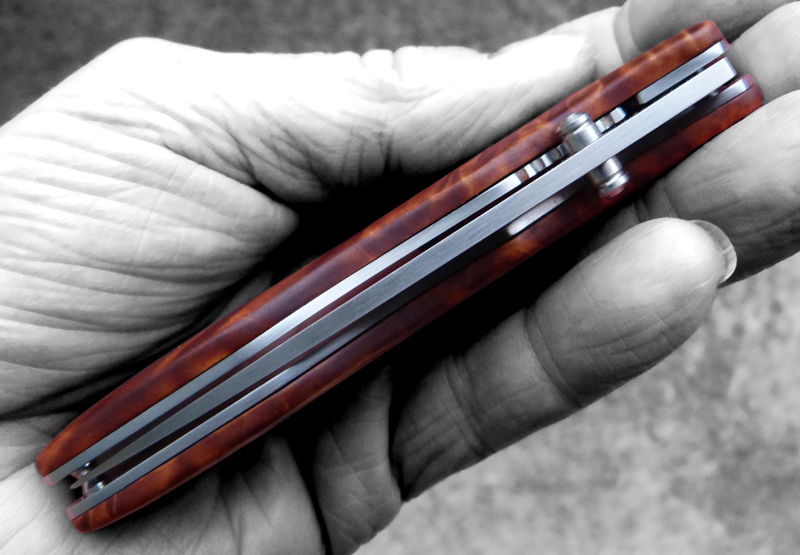 Liner lock construction. 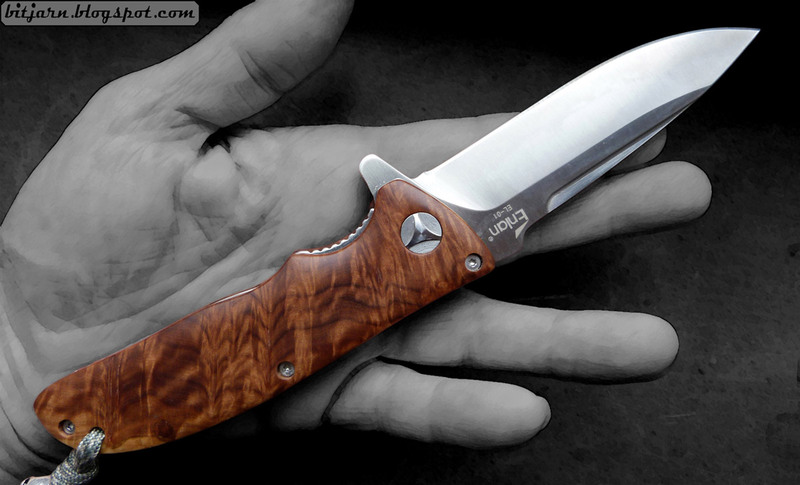 Robust and tough Enlan EL01 folding knife. 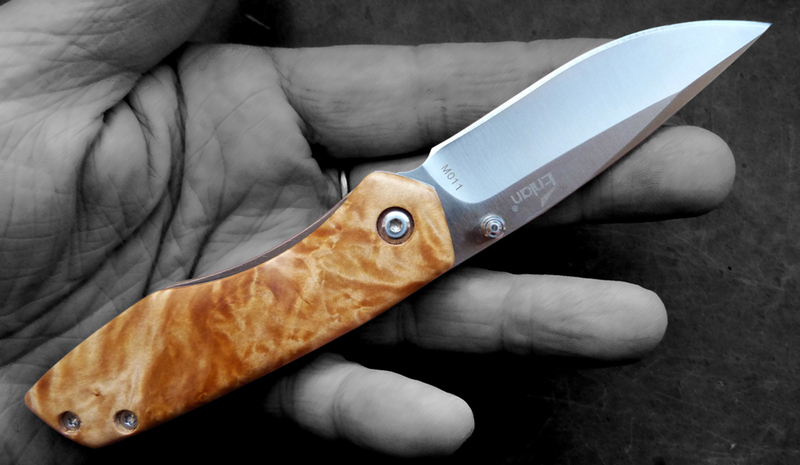 Handle in Eucalypthus burl. 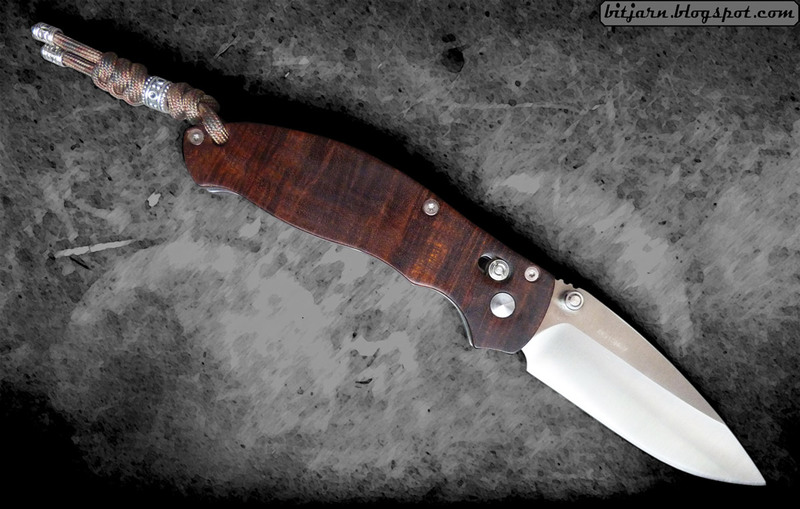 Blade in 8Cr13Mov stainless steel. 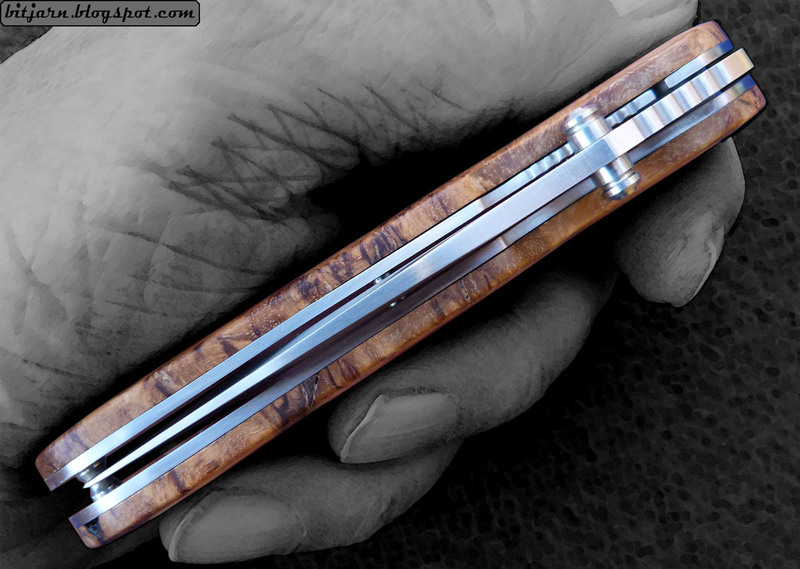 Liner lock construction. 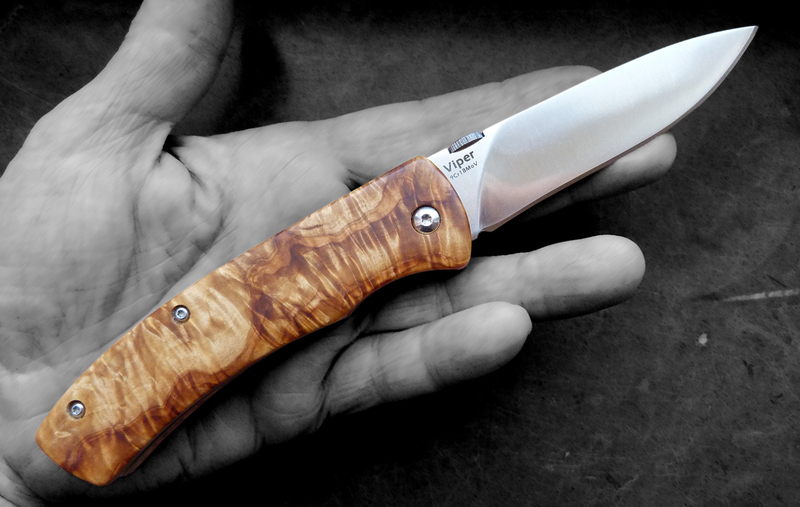 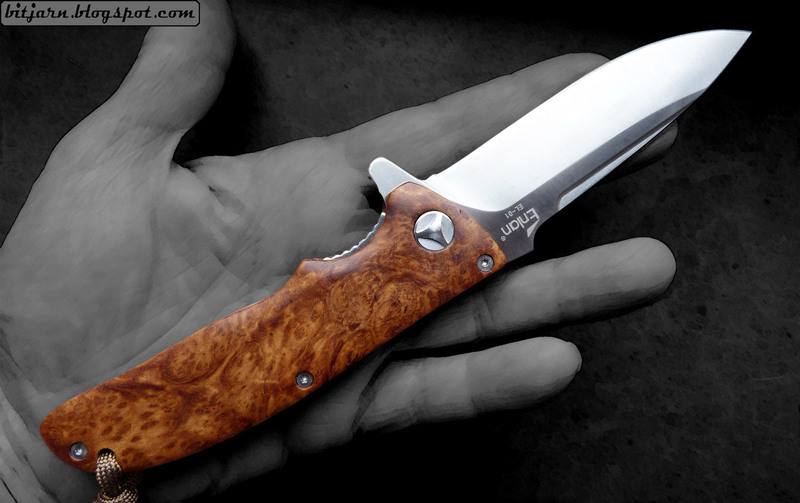 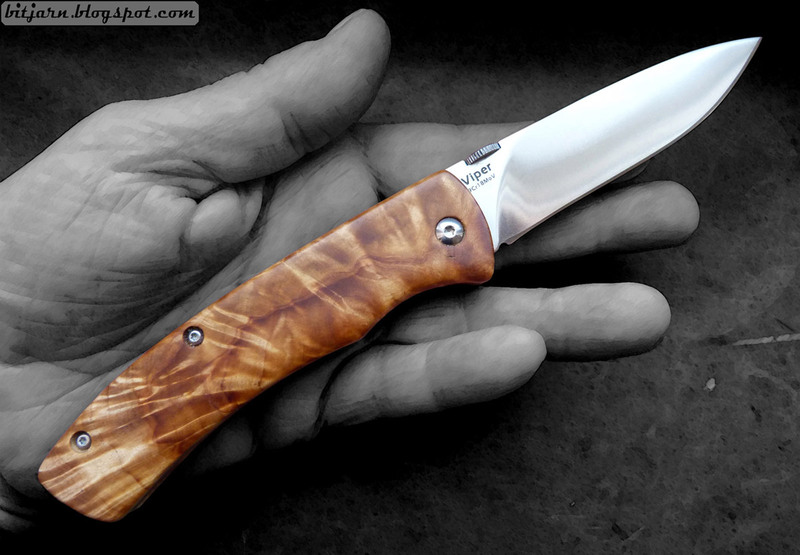 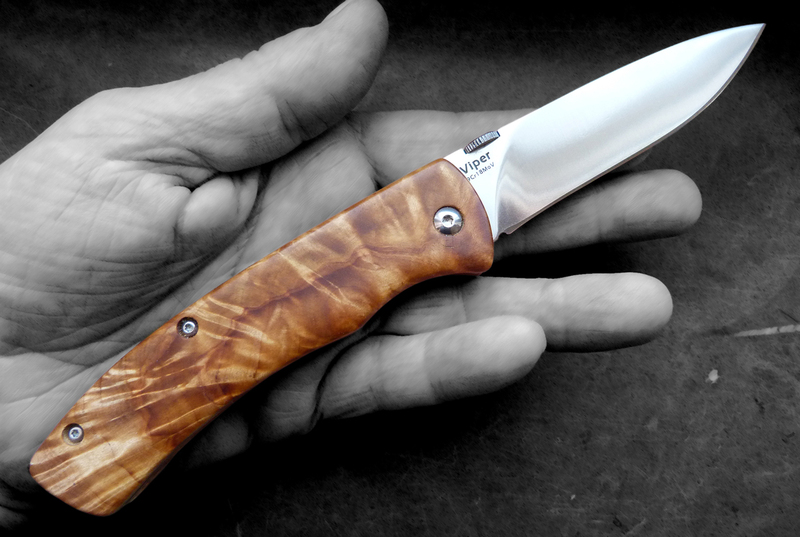 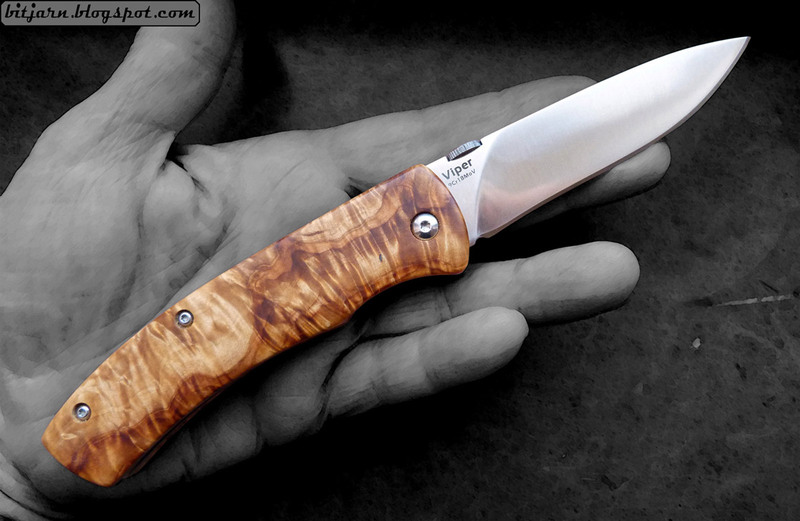 Enlan L06 folding knife with handle in york gum burl and blade in 8Cr13Mov stainless steel. 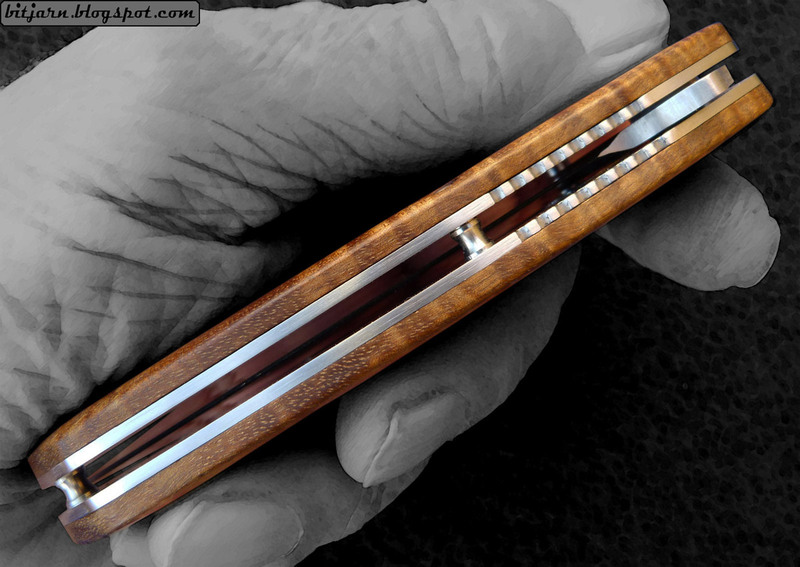 Liner lock construction. 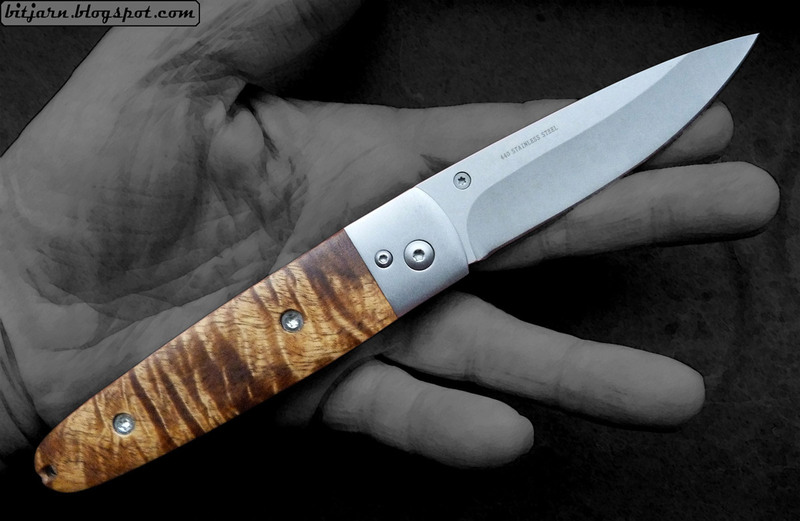 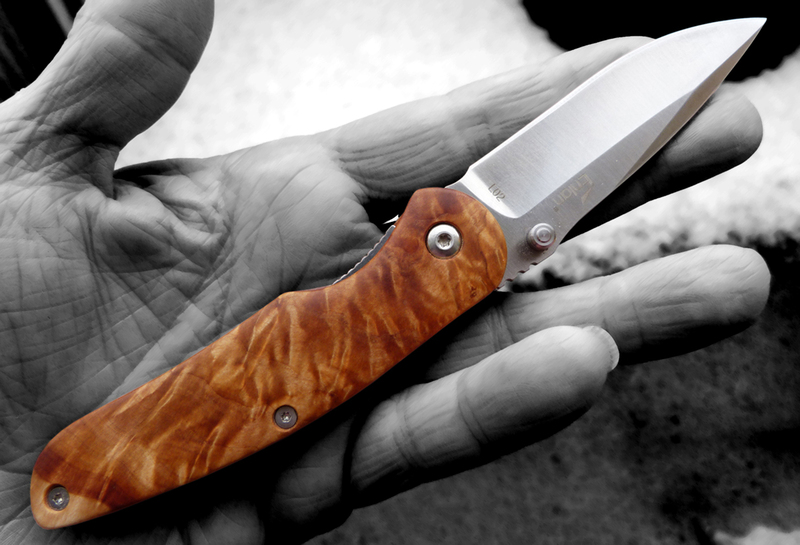 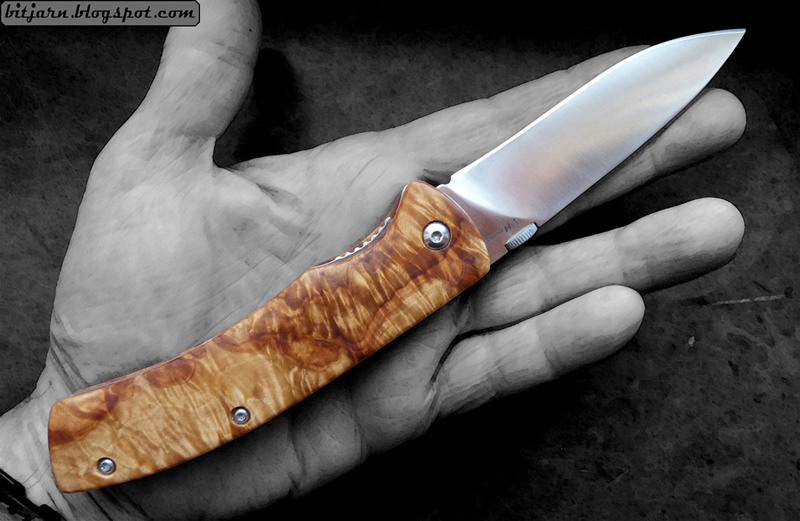 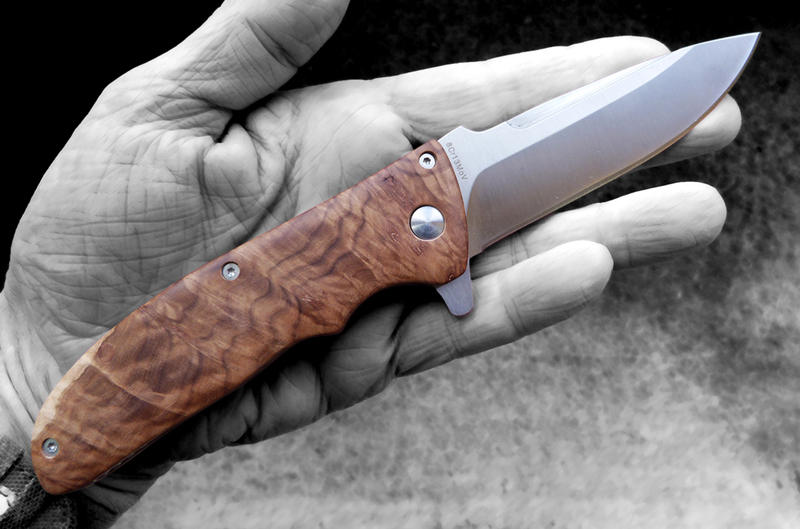 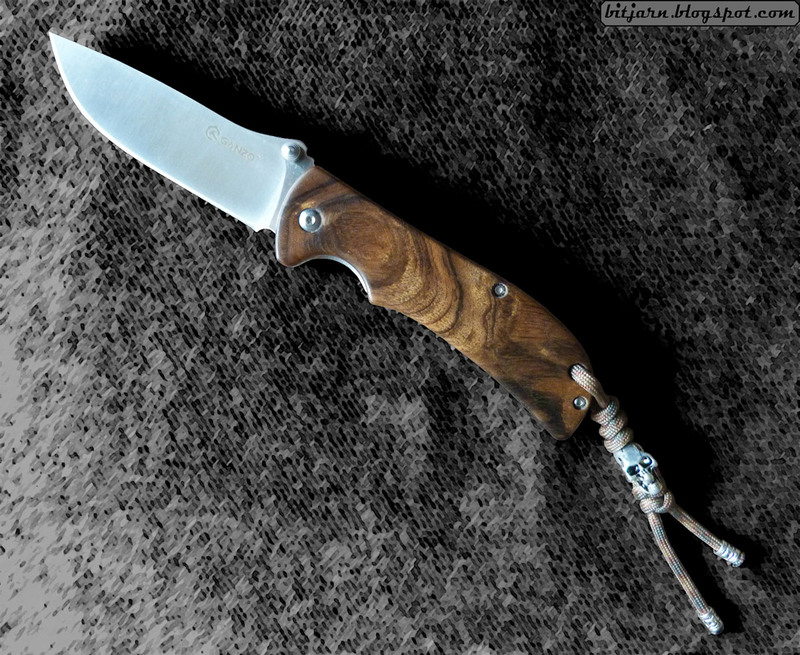 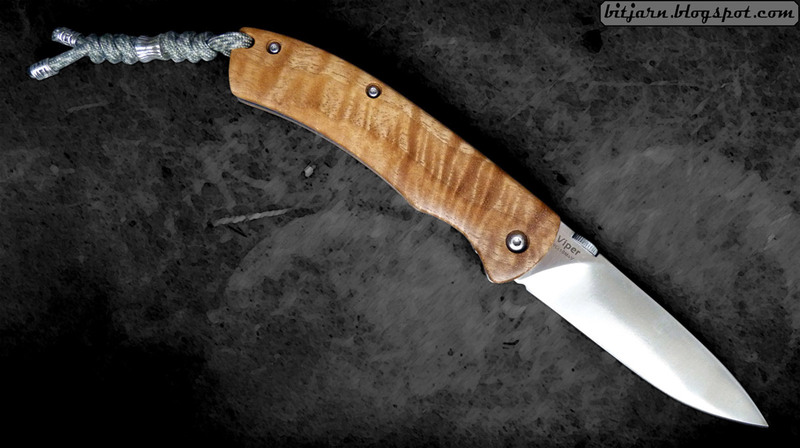 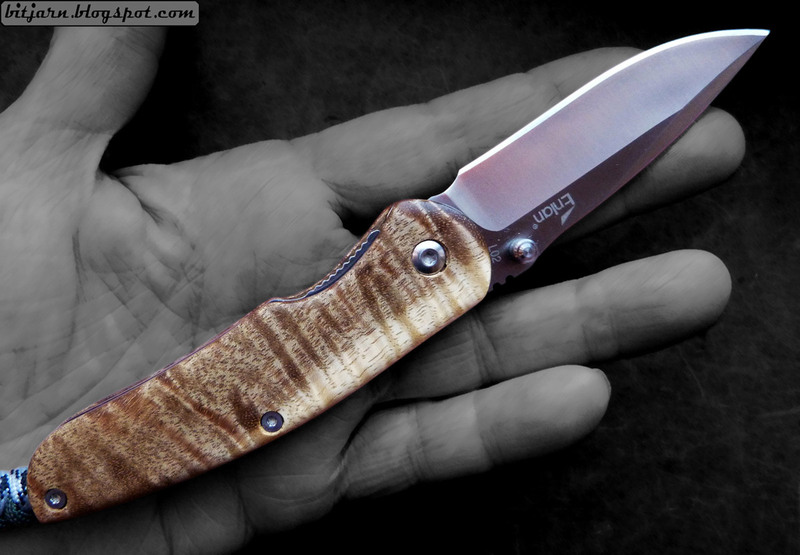 Enlan EM01 folding knife with handle in birch burl and blade in 8Cr13Mov stainless steel. 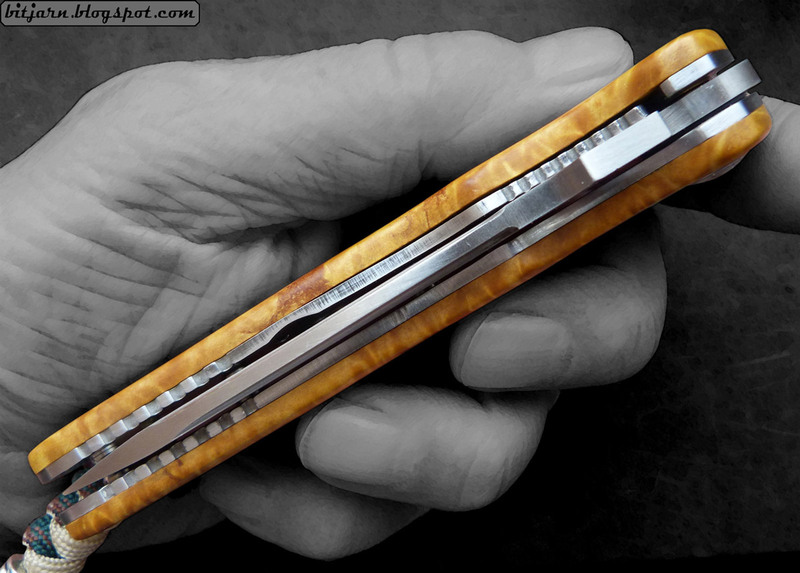 Liner lock construction. 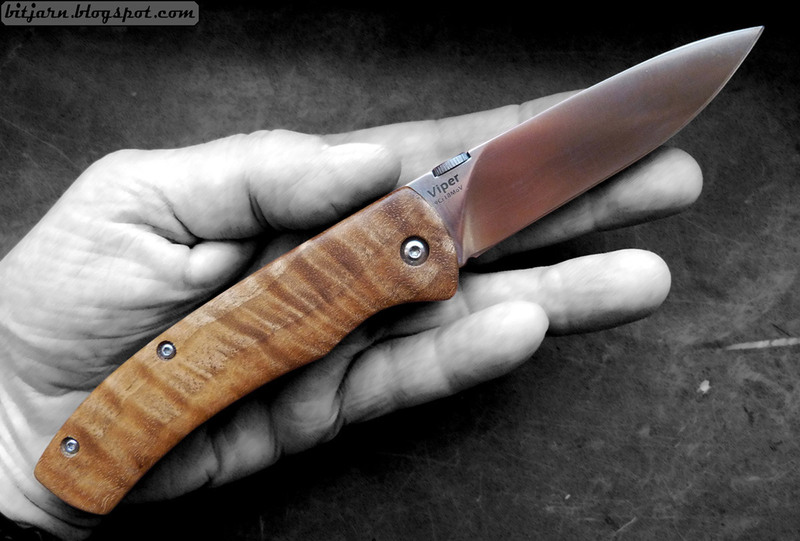 Robust and tough Enlan EL01 folding knife. 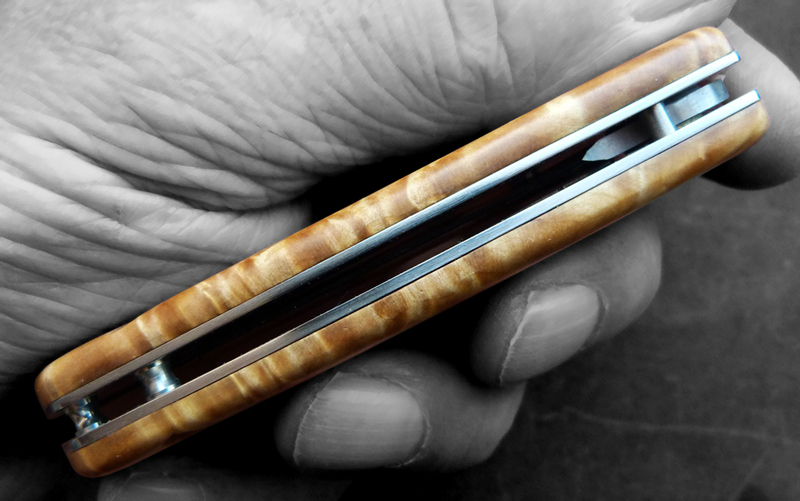 Handle in cocobolo, sap & heartwood. 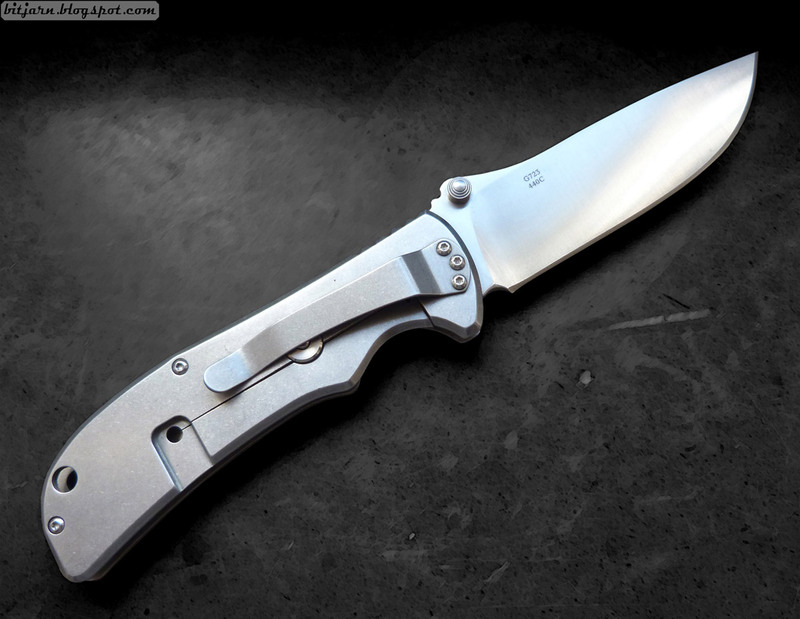 Blade in 8Cr13Mov stainless steel. 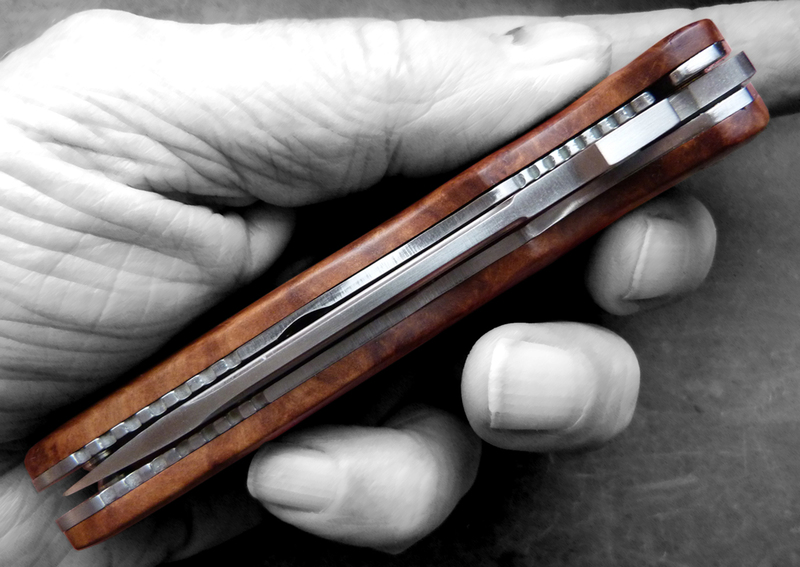 Liner lock construction. 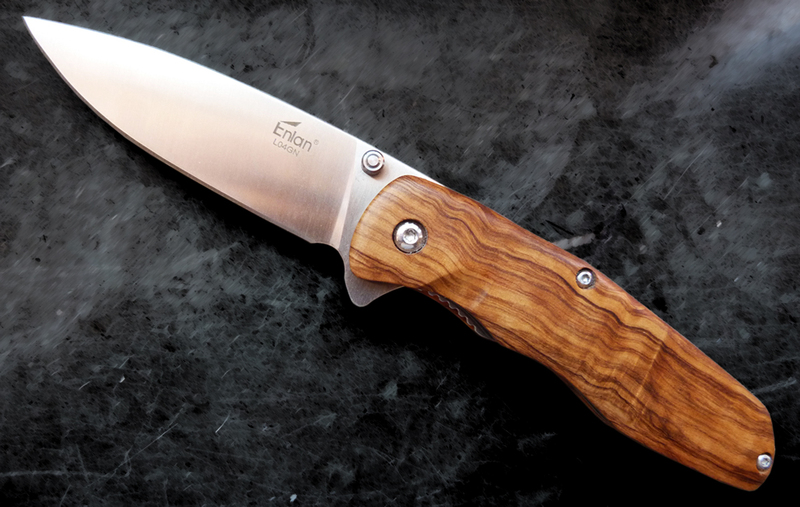 Enlan L04 folding knife with handle in Olive wood and blade in 8Cr13Mov stainless steel. 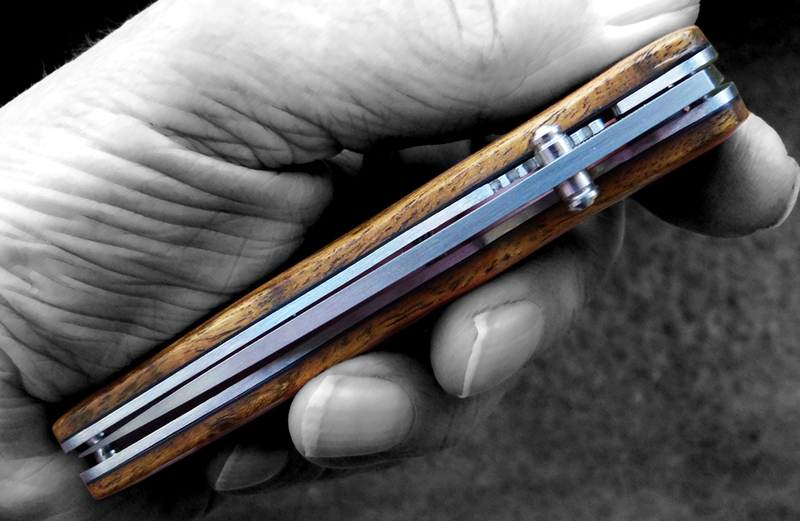 Liner lock construction. 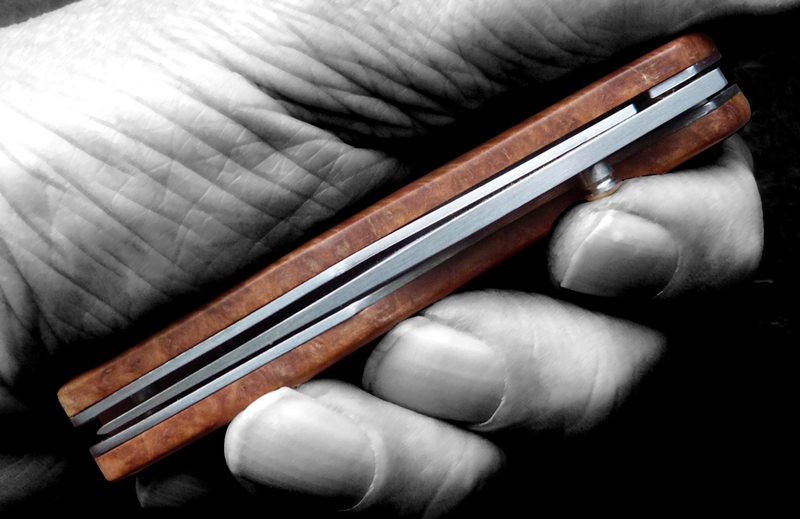 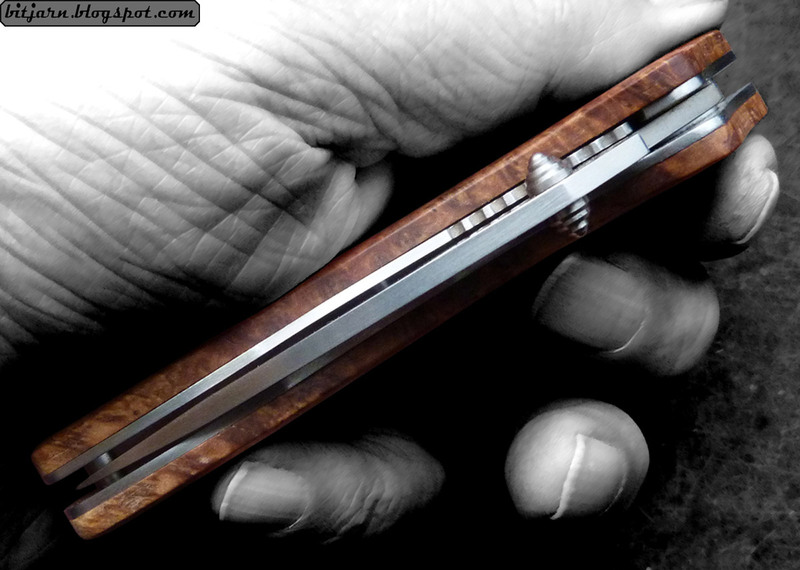 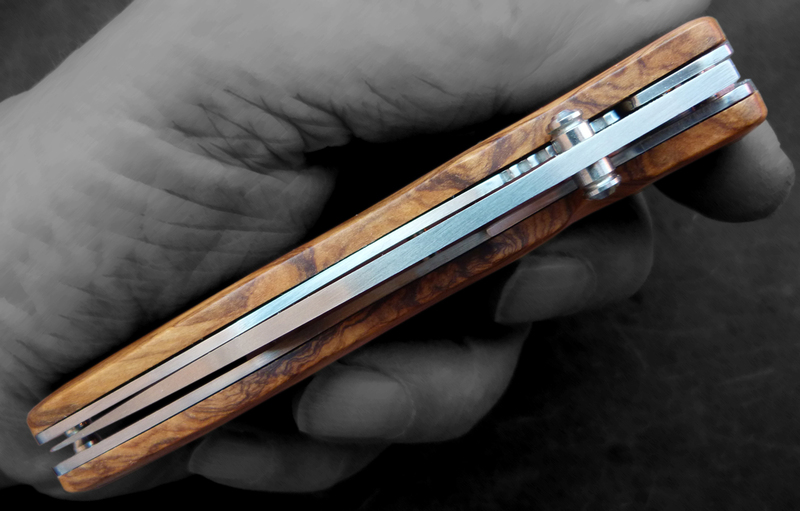 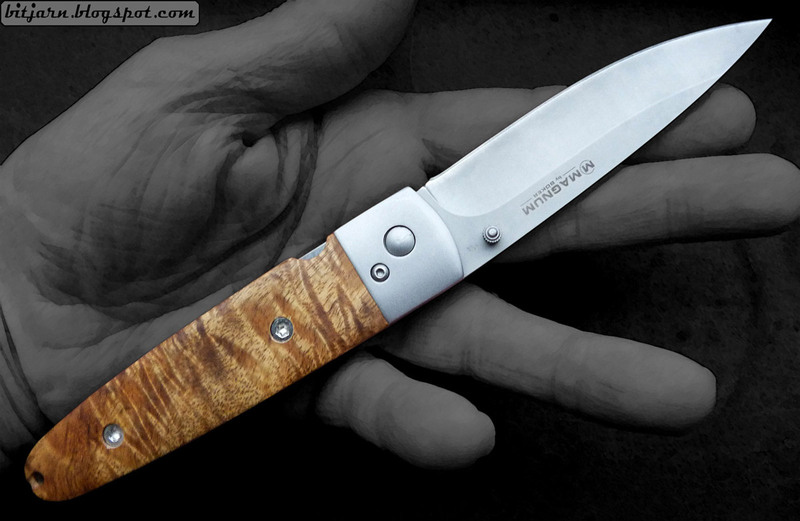 Enlan L04 folding knife with handle in Ropala Lacewood and blade in 8Cr13Mov stainless steel. 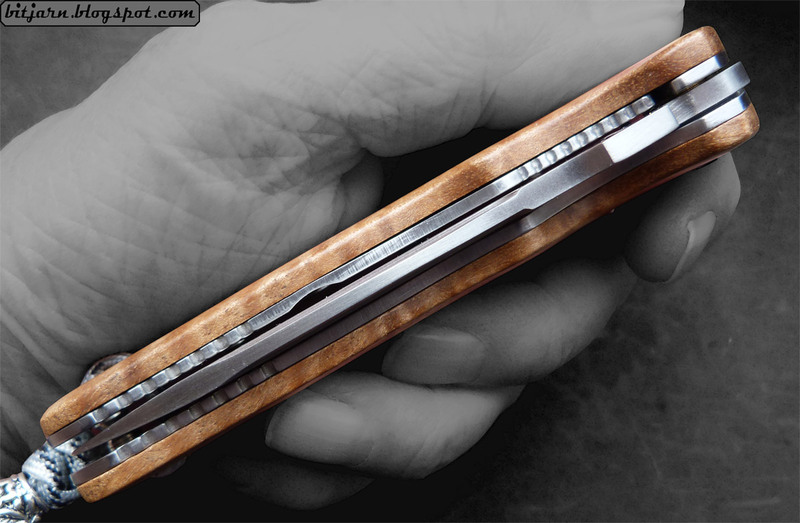 Liner lock construction. 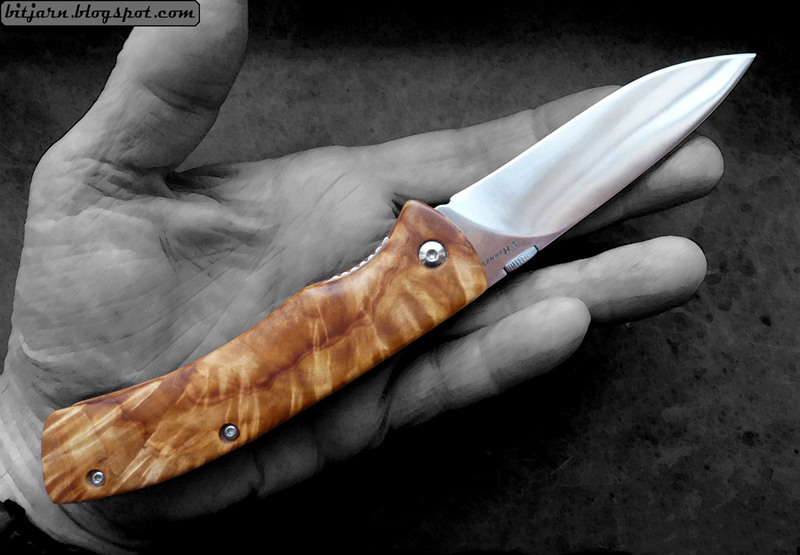 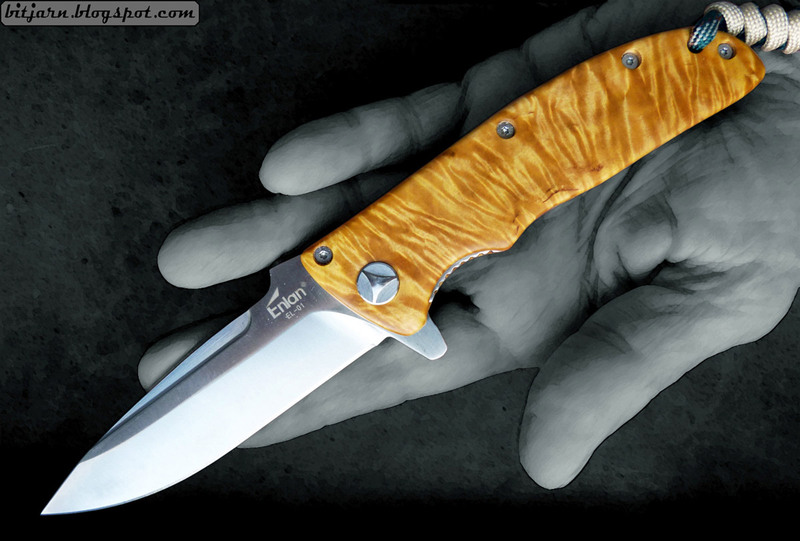 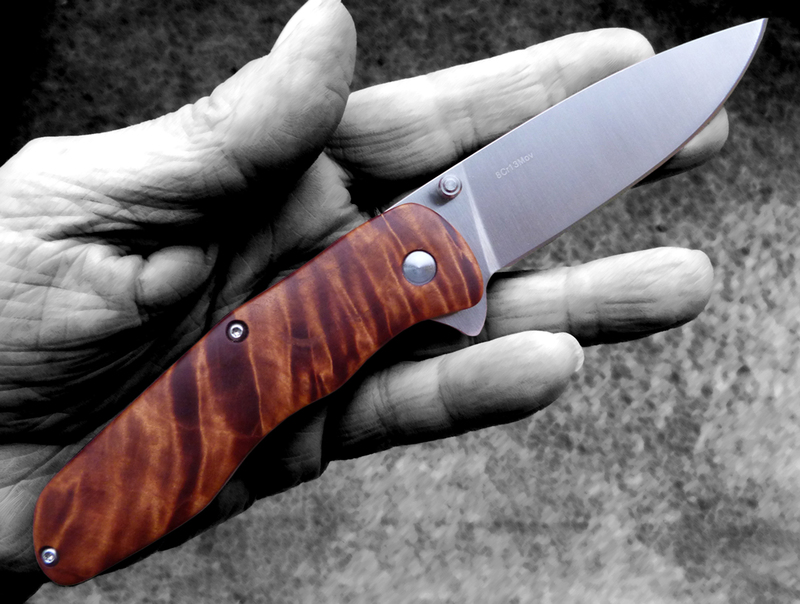 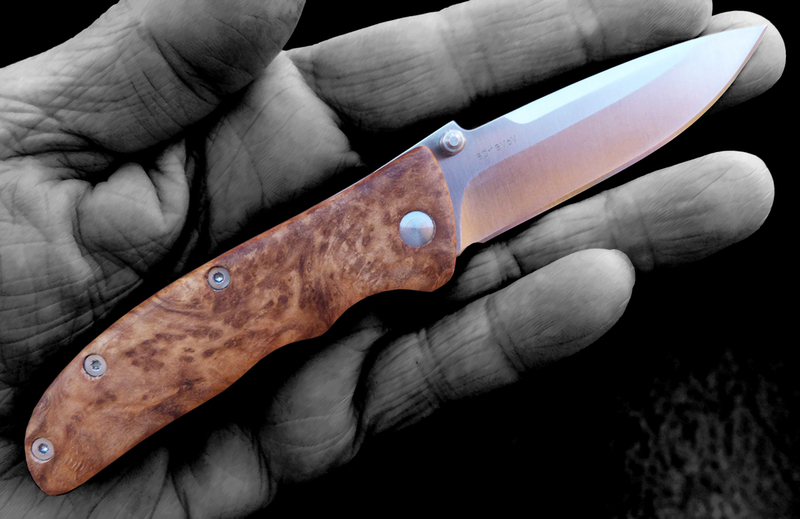 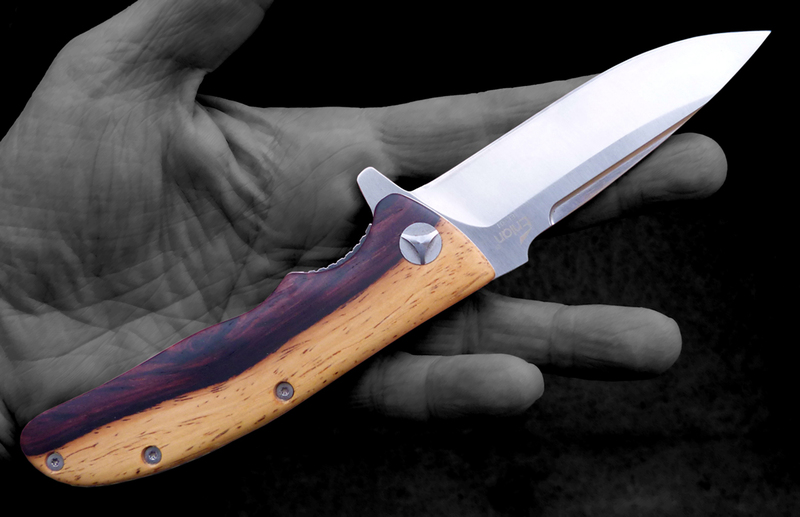 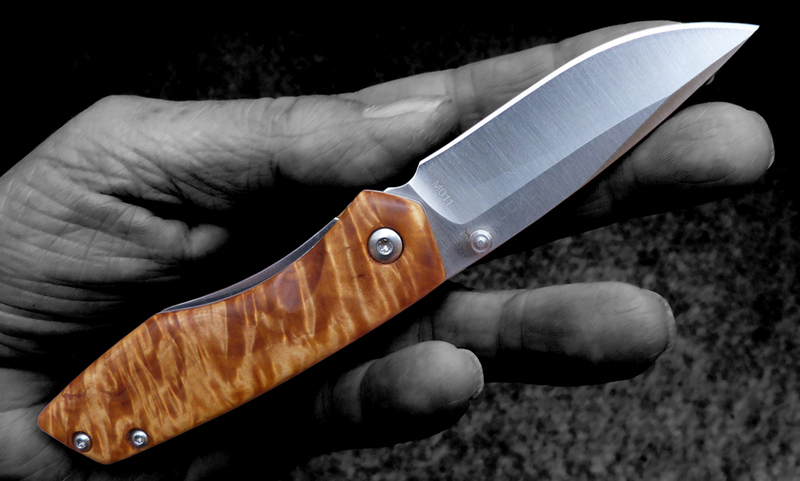 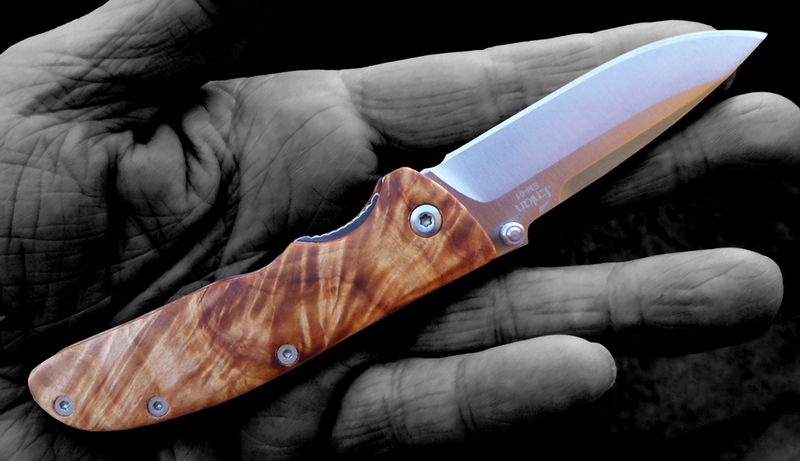 Enlan L04 folding knife with handle in dyed Birch burl and blade in 8Cr13Mov stainless steel. 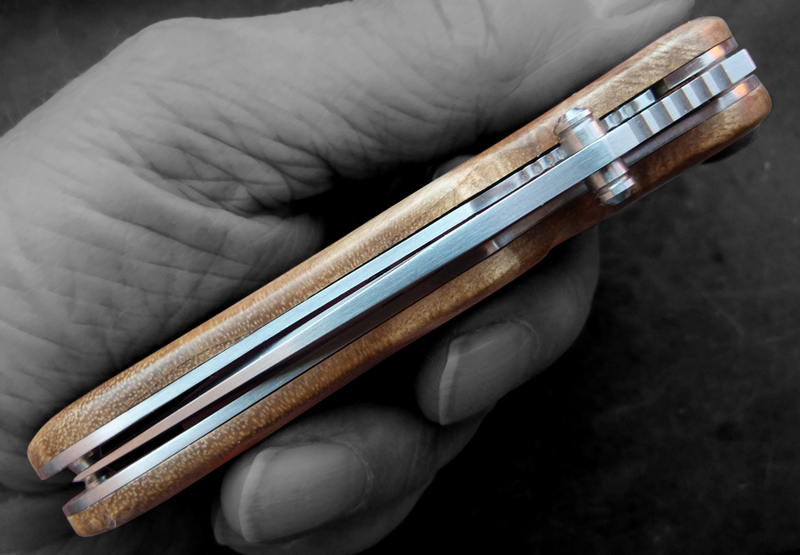 Liner lock construction. 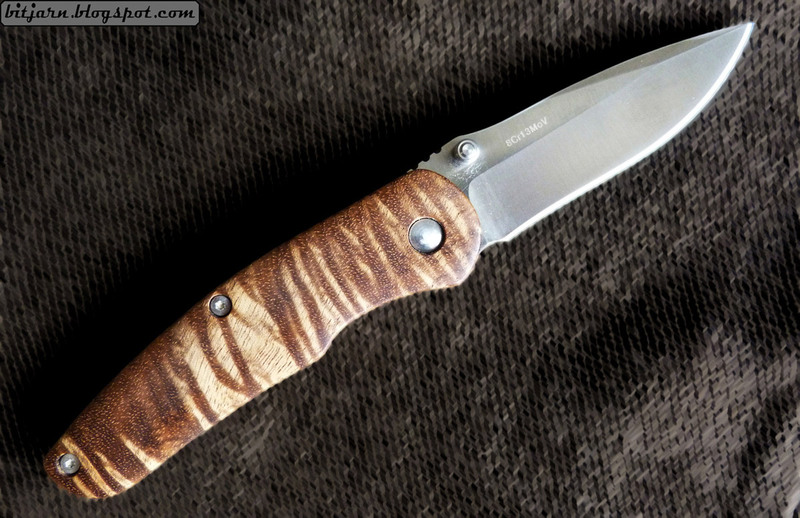 Enlan L04 folding knife with handle Bocote wood and blade in 8Cr13Mov stainless steel. 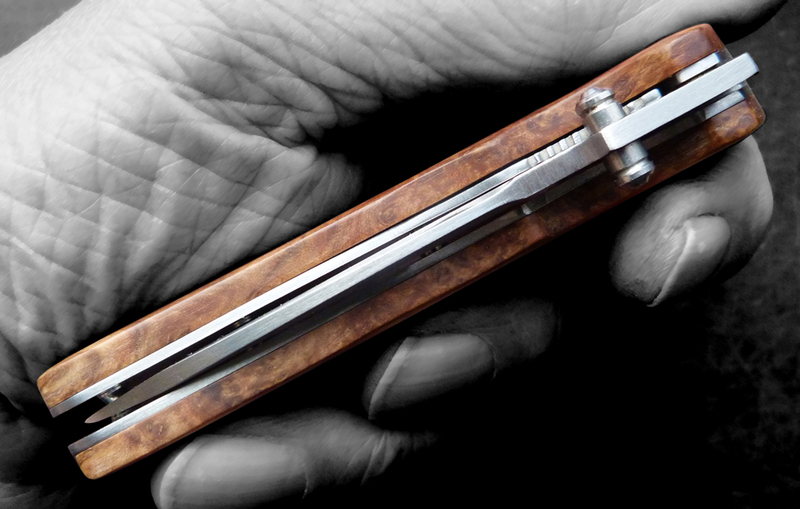 Liner lock construction. 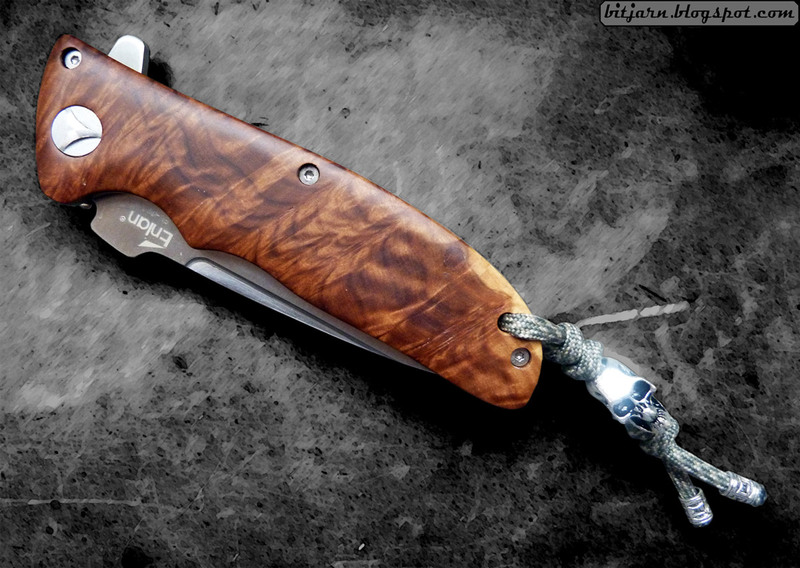 Enlan L02 folding knife with handle in Myrtle burl and blade in 8Cr13Mov stainless steel. 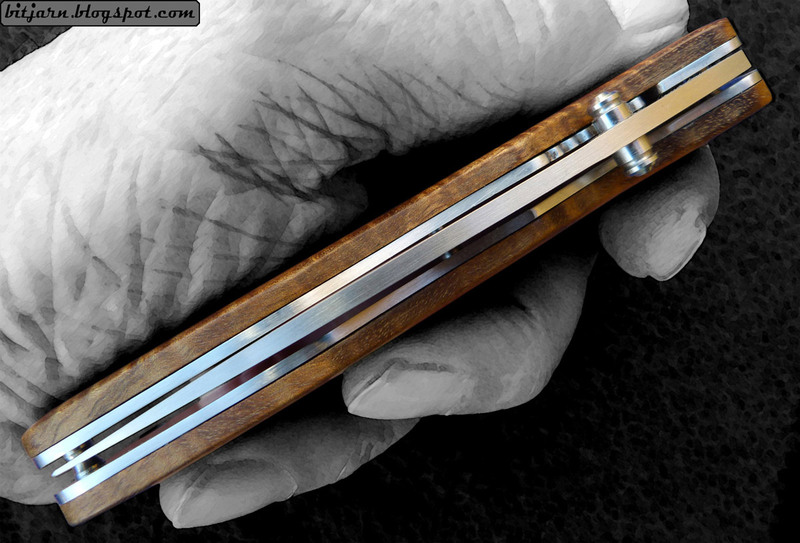 Liner lock construction. 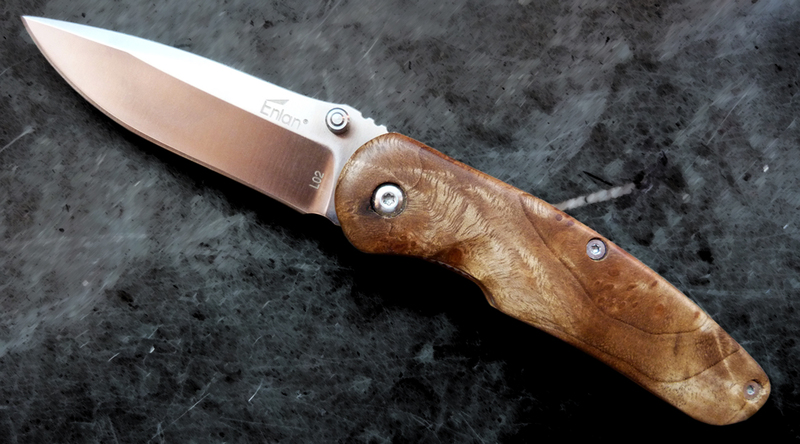 Enlan L02 folding knife with handle in Birch burl and blade in 8Cr13Mov stainless steel. 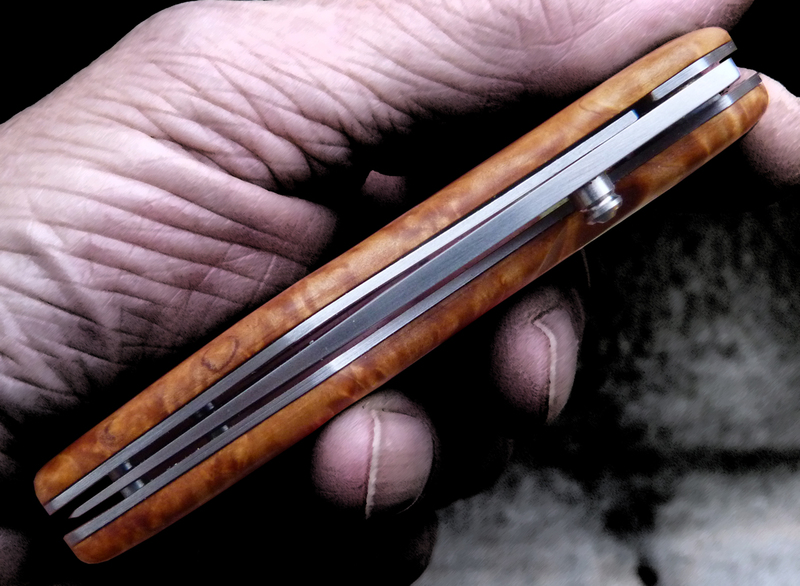 Liner lock construction.